A bacterium called Staphylococcus aureus causes many infections in humans, especially in hospital patients with weakened immune systems. These infections are generally treated with drugs known as antibiotics that interact with specific proteins in the bacteria to kill the cells, or stop them from growing. However, some S. aureus infections are resistant to the antibiotics currently available so there is a need to develop new drugs that target different bacterial proteins. Bacteria multiply by dividing to make identical copies of themselves. When a bacterium is preparing to divide, filaments made of a protein called FtsZ form a ring at the site where the cell will split. Many other proteins are involved in controlling how and when a cell divides. For example, several species of bacteria harbor a dispensable cell division protein called GpsB. In at least one organism, it helps to maintain the proper shape of the cell during cell division. In S. aureus, though, GpsB is essential for cells to survive and could therefore be a potential target for new antibiotics. However, its role in S. aureus has not been studied. Eswara et al. have now used genetic and biochemical approaches to study the S. aureus form of the GpsB protein. The experiments show that GpsB moves to the middle of S. aureus cells just before they begin to divide and binds directly to FtsZ. This helps to secure the position of FtsZ across the middle of the cell and activates the protein so that the cell can begin to divide into two. In cells that produce too much GpsB, the FtsZ proteins become active too early, leading to the cells growing larger and larger until they burst. The findings of Eswara et al. reveal that GpsB plays a different role in S. aureus cells than in some other species of bacteria. Further studies into such differences could help researchers to develop new antibiotics, as well as improving our understanding of why bacteria are so diverse. Bacterial cell division has been extensively studied in rod-shaped organisms such as Escherichia coli and Bacillus subtilis (Adams and Errington, 2009; Lutkenhaus et al., 2012; Rowlett and Margolin, 2015; Tsang and Bernhardt, 2015). However, spherical bacteria lack several key components found in these well-studied model organisms (Pinho et al., 2013), so fundamental features of how they divide are poorly understood. The Gram-positive human pathogen Staphylococcus aureus is a spherical bacterium that is commensal in ~30% of the U.S. population (Kuehnert et al., 2006), but in immunocompromised individuals, it is a leading cause of bacteremia and nosocomial infections in industrialized nations (Klevens et al., 2007). The emergence of several antibiotic resistant strains of S. aureus has necessitated the identification of novel antibiotic targets (Pendleton et al., 2013). In recent years, components of the bacterial cell division machinery have been proposed as such targets (Lock and Harry, 2008; Sass and Brötz-Oesterhelt, 2013). GpsB is a small coiled-coil cell division protein (Claessen et al., 2008; Rismondo et al., 2016; Tavares et al., 2008) that is widely conserved in the Firmicutes phylum and is conditionally required for growth in certain species, depending on growth media and temperatures (Claessen et al., 2008; Fleurie et al., 2014; Land et al., 2013; Rismondo et al., 2016; Tavares et al., 2008). GpsB is highly co-conserved (Pinho et al., 2013) with the cell division protein DivIVA. Like DivIVA, GpsB is relatively small and harbors a highly homologous N-terminal α-helical domain. However, the C-terminus differs from that of DivIVA: whereas DivIVA assembles into an anti-parallel tetramer, the GpsB structure was reported to hexamerize with a parallel alignment of helices (Rismondo et al., 2016). Similar to DivIVA (Kaval and Halbedel, 2012), GpsB orthologs perform slightly different functions in different species. In the rod-shaped Bacillus subtilis and Listeria monocytogenes, GpsB participates in shuttling a cell wall assembly protein (PBP1 or PBP A1, respectively) to help maintain the characteristic rod shape of the bacterium (Claessen et al., 2008; Rismondo et al., 2016). In the ovoid-shaped Streptococcus pneumoniae, GpsB additionally has been reported to interact with PBP2a, PBP2b, and MreC, and has been implicated in recruiting a Ser/Thr kinase to mid-cell that activates cell wall assembly machinery specifically at the division septum, thereby modulating a switch between peripheral and medial cell wall assembly to again maintain the proper shape of the cell (Fleurie et al., 2014; Rued et al., 2017). In all reported cases, GpsB interacts with a peripheral divisome component, EzrA, but not necessarily core components of the division machinery, to mediate its role in cell shape maintenance (Claessen et al., 2008; Fleurie et al., 2014; Rued et al., 2017; Steele et al., 2011). In S. aureus, GpsB is an essential protein (Santiago et al., 2015) (M. Santiago, personal communication), but its cellular function is poorly understood. Herein, we report that GpsB interacts directly with bacterial tubulin homolog FtsZ, the core component of the division machinery, and orchestrates the dynamics of its assembly. In vivo, we show that GpsB localizes to mid-cell at the onset of cell division and co-constricts with the divisome during cytokinesis. Depletion of GpsB in vivo arrested cell division and prevented the robust assembly of the divisome at mid-cell. In vitro, we show that purified GpsB promotes lateral interactions between FtsZ polymers in a manner reminiscent of bundling, thereby increasing the local concentration of FtsZ, and organizes the polymers. Unlike other proteins that exhibit FtsZ bundling activity, GpsB stimulated FtsZ GTPase activity. Consistent with this activity, overproduction of GpsB in vivo inhibited cell division and resulted in the production of large S. aureus cells. Our data suggest that, compared to GpsB orthologs in other Gram-positive bacteria, S. aureus GpsB plays a significantly different role by directly interacting with central component of the division machinery to regulate the remodeling of the divisome during cytokinesis: first, by bundling and stabilizing FtsZ polymers at mid-cell by promoting lateral interactions between FtsZ filaments, which increases the local concentration and triggers the GTPase activity of FtsZ and allows cytokinesis to proceed. To initially investigate if Staphylococcal GpsB (GpsBSa) performs a similar function as the B. subtilis GpsB ortholog (GpsBBs), we expressed gpsBSa under the control of an inducible promoter in B. subtilis. In the presence of inducer, otherwise WT B. subtilis harboring either gpsBSa or gpsBSa-GFP exhibited a severe growth defect (Figure 1). In contrast, cells similarly expressing gpsBBs or gpsBBs-GFP did not exhibit a growth defect (Figure 1A), suggesting that cell toxicity was specifically due to expression of the S. aureus ortholog of gpsB (Figure 1—figure supplement 1A). Immunoblotting with antisera specific to GpsBSa revealed a ~ 3.2 fold overproduction of GpsBSa at a population level in the presence of inducer (Figure 1—figure supplement 1B; note that the anti-GpsBSa antiserum did not recognize GpsBBs). In the absence of inducer, B. subtilis cells harboring gpsBSa examined by epifluorescence microscopy were of uniform length and displayed division septa at mid-cell (Figure 1B), but in the presence of inducer, these cells were filamentous with segregated chromosomes that rarely elaborated division septa (Figure 1C). GpsB interacts with several cell division proteins in different Gram-positive bacteria (Claessen et al., 2008; Cleverley et al., 2016; Pompeo et al., 2015). Deletion of ezrA, ponA, prkC, or gpsB resulted in minor morphological defects in B. subtilis, but overproduction of GpsBSa in these strain backgrounds nonetheless resulted in filamentation (Figure 1D–K). Additionally, while deletion of divIVA resulted in cell elongation (Edwards and Errington, 1997), overproduction of GpsBSa in the absence of DivIVA resulted in further filamentation (Figure 1L–M). Thus, the B. subtilis filamentation phenotype resulting from GpsBSa overproduction does not require these peripheral cell division factors. We next examined if GpsBSa affects FtsZ localization. In the absence of inducer, FtsZ-GFP localized properly to mid-cell at incipient and active sites of cell division (Figure 1N). However, upon overproduction of GpsBSa, filamentous cells displayed diffuse localization of FtsZ-GFP in the cytosol (Figure 1O), suggesting that GpsBSa overproduction interferes with the localization of the central component of the B. subtlis cell division machinery. Overexpression of S.aureus gpsB inhibits cell division in B. subtilis. (A) Luria-Bertani agar plates streaked with wild type B. subtilis (WT, strain PY79), or otherwise wild type B. subtilis harboring an inducible copy of gpsBBs (GG18), gpsBBs-gfp (GG19), gpsBSa (GG7), or gpsBSa-gfp (GG8) integrated into the chromosome, in the absence (left) or presence (right) of inducer. (B–M) Morphology of cells of different deletion mutants of B. subtilis (ΔezrA, GG35; ΔponA, CS26; ΔprkC, CS24; ΔgpsB, CS40; ΔdivIVA, CS94) harboring an inducible copy of gpsBSa grown in the absence (B, D, F; H, J, L) or presence (C, E, G, I, K, M) of inducer. (N–O) Localization of FtsZ-GFP in a strain (GG9) harboring an inducible copy of gpsBSa grown in the absence (N) or presence (O) of inducer. Membranes (red; B–O) visualized using the fluorescent dye FM4-64; chromosomes (blue; B–M) visualized using DAPI; FtsZ-GFP localization (green; N–O). Scale bar: 1 μm. Genotypes are listed in Key Resources Table. In B. subtilis, gpsB is not essential for growth, but deletion of ezrA (a peripheral component of the divisome) together with gpsB is synthetically lethal (Claessen et al., 2008). In B. subtilis cells harboring a gpsB deletion and expressing gpsBBs, we obtained 865 ± 157 transformants harboring a deletion in ezrA (n = 3, per ~400 ng of transformed DNA containing ezrA deletion), whereas we did not recover any transformants when we attempted to delete ezrA in ∆gpsB cells that expressed gpsBSa, indicating that gpsBSa was unable to complement the gpsBBs deletion phenotype. Together with the different phenotypes observed upon overexpression of either gpsBBs or gpsBSa in B. subtilis, the data suggested that S. aureus GpsB may exhibit a different function or activity. To test the effect of GpsBSa overproduction in Staphylococci, we cloned gpsBSa in a high copy plasmid under control of an inducible promoter, introduced the construct into S. aureus strain SH1000, stained the cells with a fluorescent membrane dye, and examined cell size using epifluorescence microscopy. Immunoblotting revealed an ~5.4 fold overproduction of GpsB at a population level relative to endogenous levels of GpsB (Figure 1—figure supplement 1C). 100% of WT cells we observed (n = 676) were less than 1.2 μm in diameter, as were WT cells harboring the empty vector (n = 100) (Figure 2A–D). In the absence of inducer, 6.4% (n = 971) of cells harboring the inducible copy of gpsBSa were larger than 1.2 μm in diameter; in the presence of inducer, 56.9% (n = 770) of cells were larger than 1.2 μm (Figure 2E–F). Interestingly, overproduction of gpsBBs did not result in a similar enlargement of S. aureus cells (Figure 2G–H), suggesting that the cell division inhibition phenotype in B. subtilis and S. aureus was unique to the overproduction of the S. aureus ortholog of GpsB. Quantification of cell diameters of 200 individual cells overproducing GpsBSa revealed a range of cell diameters higher than 1.2 µm in over half of the cells (Figure 2K). The variation in cell diameters was likely due to unequal expression of gpsBSa in every cell, since control experiments in which gfp was placed under control of the inducible promoter revealed that only ~34% of cells (n = 263) produced GFP in the presence of inducer. Overexpression and depletion phenotypes of gpsB in S.aureus. (A–J) Morphology of wild type S. aureus cells (A-B; strain SH1000) or S. aureus strains harboring a plasmid encoding an inducible copy of gpsBSa (E–F; plasmid pPE45), vector backbone alone (C–D; pCL15), gpsBBs (G–H; pPE83), or gpsBSa-L35S (I–J; pPE79) in the absence (A, C, E, G, I) or presence (B, D, F, H, J) of inducer. (K) Histogram of cell diameters of 200 individual S. aureus cells harboring an inducible copy of gpsBSa grown in the absence (blue) or presence (orange) of inducer IPTG. (L–M) Morphology of S. aureus cells harboring a plasmid encoding an inducible copy of antisense RNA against gpsB (L; SH1000 pGG59) or empty vector (M) at times (min) indicated to the left after induction. Arrow indicates a cell that has already initiated cell division when GpsB depletion was initiated; arrowhead indicates a cell that had not initiated cell division at the time of GpsB depletion. Membranes visualized using FM4-64. Scale bar: 1 μm. The gpsB gene is essential for viability in S. aureus (Santiago et al., 2015). Consistent with this observation, we were unable to knockout the gene, even in the presence of a complementing multicopy plasmid, presumably due to the disruptive overproduction phenotype described above. We therefore sought to deplete GpsB by overexpressing gpsB antisense RNA under the control of an inducible promoter from a multicopy plasmid and examined the morphology of cells using fluorescence microscopy (antisense resulted in ~2.5-fold reduction in GpsB; Figure 1—figure supplement 1F) . Immediately after addition of the inducer, cells harboring this construct were morphologically similar to cells harboring the empty vector (Figure 2L–M). At later time points, we observed that cells harboring the depletion construct that had already elaborated a division septum (Figure 2L, arrow) did not complete cytokinesis. Instead, the division septa became deformed and membrane aberrantly accumulated as foci. Cells that had not yet initiated cell division at the time of induction (Figure 2L, arrowhead) did not elaborate division septa and also accumulated aberrant membrane foci. In contrast, cells harboring only the empty vector (Figure 2M) elaborated division septa and completed cytokinesis during the observation period. The severe growth defect imposed by gpsBSa overexpression in B. subtilis permitted us to isolate suppressor mutations that could correct this defect. One such mutation, an intragenic single nucleotide change in gpsBSa, altered the specificity of a highly conserved codon at position 35 from Leu to Ser (Figure 1—figure supplement 1A, boxed residue), and allowed B. subtilis cells overexpressing gpsBSa-L35S to grow normally. To check if the L35S substitution caused in a major structural change in the protein, we purified WT GpsBSa and the L35S variant and examined the α-helical content of both proteins using circular dichroism (CD) spectroscopy (Figure 1—figure supplement 1D). The CD spectrum revealed similar profiles for each protein, suggesting that the L35S substitution did not grossly affect the secondary structure of GpsBSa. In the presence of inducer, S. aureus cells harboring inducible gpsBSa-L35S did not exhibit a cell enlargement defect (Figure 2I–J). Taken together, we conclude that overproduction of GpsBSa, but not GpsBBs, inhibits cell division in both S. aureus and B. subtilis, resulting in cell filamentation (in B. subtilis) or cell enlargement (in S. aureus), like the depletion phenotype of FtsZ (Pinho and Errington, 2003). Depletion of GpsB in S. aureus, however, arrested cell division without a coincident enlargement of cells and ultimately caused aberrant membrane accumulation. Furthermore, substitution of Leu35 to Ser abolished the toxicity resulting from GpsB overproduction, suggesting that this residue is critical for GpsBSa function. We next examined the subcellular localization of GpsBSa-GFP in S. aureus. In non-dividing cells GpsBSa-GFP (produced at lower levels that did not result in cell division inhibition) localized near the cell periphery (Figure 3A, arrowhead). In dividing cells, GpsBSa-GFP localized to mid-cell, between the segregated chromosomes, and co-localized with the constricting membrane (Figure 3A, arrow). In contrast, GpsBSa-L35S-GFP localized primarily in the cytosol in both dividing and non-dividing cells (Figure 3A). Likewise, when produced at lower levels in B. subtilis, GpsBSa-GFP accumulated at division septa, whereas the L35S variant localized primarily in the cytosol (Figure 1—figure supplement 2). Since the L. monocytogenes GpsB ortholog is membrane-associated (Rismondo et al., 2016), we next tested if the L35S substitution could have disrupted any intrinsic membrane affinity of GpsBSa by fractionating S. aureus cell extracts and examining the distribution of GpsBSa-GFP and GpsBSa-L35S-GFP by immunoblotting (Figure 1—figure supplement 1E). Unlike L. monocytogenes GpsB, we detected S. aureus GpsB-GFP exclusively in the soluble fraction, suggesting that it does not directly associate with the Staphylococcal membrane. GpsBSa-L35S-GFP was similarly detected in the cytosolic fraction. Association of L. monocytogenes GpsB with the membrane is reportedly mediated by Leu24, since substitution of Leu24 with Ala disrupted membrane association (Rismondo et al., 2016). Interestingly, the corresponding residue in S. aureus GpsB is Ala (Figure 1—figure supplement 1A, asterisk), consistent with the apparent lack of intrinsic affinity of S. aureus GpsB for the membrane. We conclude that, unlike L. monocytogenes GpsB, S. aureus GpsB (hereafter, simply ‘GpsB’) is likely not directly membrane-associated and that cell peripheral localization of S. aureus GpsB may be mediated by another factor. Dynamic redistribution of GpsB to mid-cell and periphery of S.aureus during the cell cycle. (A) Localization of GpsB-GFP (top, SH1000 pPE46) or GpsBL35S-GFP (bottom, SH1000 pPE80) to mid-cell in actively dividing cells (arrow) and to the periphery of cells that are not dividing (arrowhead). First panel: membranes visualized using FM4-64; second panel: GFP fluorescence; third panel: chromosomes visualized using DAPI; fourth panel: overlay of membrane, GFP, and DNA. (B) GpsB-GFP localization in S. aureus cells at various stages of division (i–iv) using structured illumination microscopy (SIM). First column: membranes visualized using FM4-64; second column: GpsB-GFP fluorescence; third column: overlay, membrane and GpsB-GFP. Columns 4–6: reconstruction of deconvolved Z-stacks and rotation of the cells in columns 1–3, respectively, around the vertical axis. (C) Time-lapse fluorescence micrographs of a dividing S. aureus cell taken at the time intervals indicated at the left. Left panels: membranes visualized using FM4-64; middle panels: GpsB-GFP fluorescence; right panels: overlay, membrane and GpsB-GFP. Depictions of GpsB-GFP localization patterns are to the right of the panels. Scale bar: 1 μm. To discern if GpsB-GFP co-localized with, or at sites adjacent to, the site of membrane constriction, we employed structured illumination microscopy (SIM) (Gustafsson, 2005), a super-resolution technique that previously provided enough resolution to discern the localization of DivIVA-GFP on either side of the ~80 nm division septum (Eswaramoorthy et al., 2011). At the onset of cell division, mid-plane images of S. aureus cells displayed only two GpsB-GFP foci that co-localized with sites of membrane invagination at mid-cell (Figure 3Bi). Reconstruction of deconvolved Z-stacks and rotation of the reconstructed image around the axis of cell division revealed that GpsB-GFP formed an irregular ring-shaped structure, reminiscent of the structure of an assembling divisome (Figure 3Bi) (Lund et al., 2018). In cells that were further advanced in cell division, the two foci of GpsB-GFP followed the leading edges of the constricting membrane (Figure 3Bii) and formed a ring structure that was smaller than the diameter of the cell, (Figure 3Bii) (Buss et al., 2015; Ebersbach et al., 2008), suggesting that the GpsB ring structure co-constricts with the division machinery. In a cell approaching completion of cytokinesis, GpsB-GFP collapsed into a single focus at the center of the invaginating membrane (Figure 3Biii), and immediately after the completion of cell division, we observed that GpsB-GFP localized largely to the cell periphery in the adjacent daughter cells (Figure 3Biv), suggesting that GpsB may dynamically localize during the cell cycle. Phototoxicity induced by SIM precluded us from performing super-resolution time lapse experiments of actively dividing cells using this method. To test the dynamic nature of GpsB-GFP localization, we followed the fate of GpsB-GFP in individual cells through three rounds of cell division using diffraction-limited epifluorescence microscopy. At the onset of our measurements, GpsB-GFP localized primarily at mid-cell in a cell that had completed cytokinesis and was poised to separate into two daughter cells (Figure 3; [Steele et al., 2011]). After cell separation, GpsB-GFP redistributed to the periphery of each daughter cell (Figure 3). Beginning the next round of cell division, GpsB-GFP re-localized to the mid-cell of each daughter cell as two foci that coincided with the invaginating membrane (Figure 3C,t). It again localized with the invaginating membrane, followed by redistribution of fluorescence to the cell peripheries of the daughter cells (Figure 3). The redistribution of peripherally-localized GpsB to the division septum is reminiscent of the FtsZ-dependent late localization of GpsB reported in S. pneumoniae (Land et al., 2013). 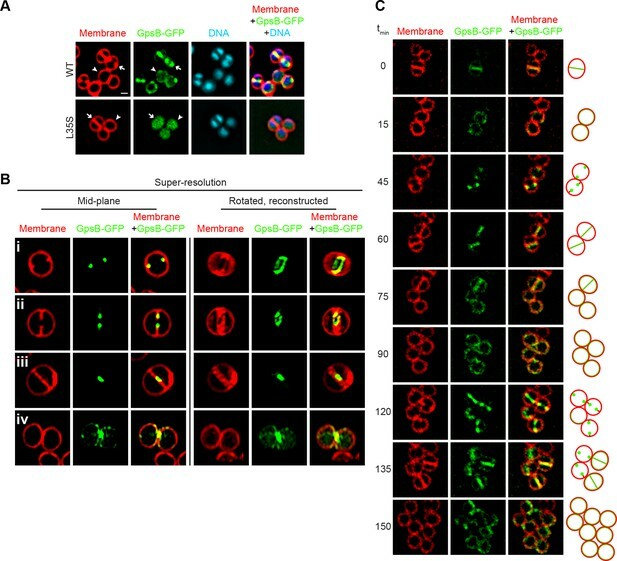 We therefore conclude that GpsB localizes as a single ring-shaped structure at mid-cell at the onset of cell division, constricts with the invaginating membrane during cytokinesis, and ultimately, after daughter cell separation, uniformly redistributes to the periphery of each daughter cell. Although the S. aureus ortholog of GpsB was non-functional in B. subtilis, its ability to localize at mid-cell suggested that it is capable of recognizing an intrinsic feature of the divisome shared between B. subtilis and S. aureus (Figure 1—figure supplement 2). The bacterial divisome is composed of approximately 10 core proteins (Lutkenhaus et al., 2012; Margolin, 2005) that direct the cell wall assembly machinery to mid-cell and mediate cell membrane constriction during cell division. The core divisome component is the bacterial tubulin homolog, FtsZ (Coltharp et al., 2016; Osawa and Erickson, 2013), which is a target of cell division regulators in different systems (Ortiz et al., 2016). To investigate a potential interaction between the divisome and GpsB, we examined the localization of GpsB-GFP in S. aureus cells grown in the presence and absence of the PC190723, a small ligand that inhibits GTPase activity of FtsZ and inhibits cell division (Andreu et al., 2010; Haydon et al., 2008). In the presence of the drug, 92.5% of cells (n = 200) harboring empty vector exhibited a diameter larger than 1.5 µm, compared to just 30.5% of cells in the absence of inhibitor, consistent with a block in cell division (Figure 4A–B’). To confirm that the drug was inhibiting divisome assembly, we examined the localization of ZapA-GFP, a known early stage cell division protein that assembles concomitantly with FtsZ (Gamba et al., 2009; Reichmann et al., 2014) and is used as a proxy for localization of FtsZ. In untreated cells, ZapA localized at mid-cell at the onset of cell division (Figure 4C–C’), but in the presence of the inhibitor, 96.5% of cells (n = 200) displayed diffuse and/or punctate localization in the cytosol that was not located at mid-cell (Figure 4D–D’), indicating that the divisome was not assembling correctly due to inhibition of FtsZ. In the absence of inhibitor, GpsB-GFP localized at mid-cell or the periphery in 55% or 30% of cells, respectively, and mis-localized in the cytosol in 15% of cells (n = 200; Figure 4E–E’). In contrast, in the presence of inhibitor, GpsB did not localize to mid-cell in any cell observed (n = 200) and instead displayed a combination of diffuse cytosolic localization and aggregation along the cell periphery (Figure 4F–F’). The data therefore indicated that that GpsB localization to mid-cell depends directly or indirectly on functional FtsZ. FtsZ and GpsB reciprocally influence each other’s subcellular localization pattern. Morphology of wild type S. aureus cells harboring empty vector (strain SH1000 pCL15) in the absence (A–A’) or presence (B–B’) of FtsZ inhibitor PC190723 as visualized in the GFP fluorescence channel (A–B) or by differential interference contrast (DIC; A’–B’). Localization of ZapA-GFP (proxy for FtsZ localization; strain SH1000 pRB42; C–D’) or GpsB-GFP (E-F’; SH1000 pPE46) in the absence (C-C'; E-E') or presence (D-D'; F-F') of S. aureus FtsZ GTPase activity inhibitor PC190723. (G–I’) Localization of ZapA-GFP in wild type (G-G’; SH1000 pRB42), or in cells harboring an IPTG-inducible copy of gpsB in the absence (H-H’; SH1000 pPE45 pRB42) or presence (I–I’) of IPTG. Localization of ZapA-GFP in cells harboring vector only (J-J’; SH1000 pRB42 pEPSA5) or vector producing gpsB antisense RNA (K-K’; SH1000 pRB42 pGG59). A-K: GFP fluorescence; A’-F’: overlay of GFP fluorescence and DIC; G’-K’: overlay of GFP fluorescence and membrane. Arrows indicate site of cell division; arrowheads indicate ZapA-GFP localization at the subsequent plane of cell division. Scale bar: 1 μm. We next tested how GpsB influences divisome assembly. In otherwise wild type cells producing ZapA-GFP, no cell enlargement was detected; among them, 53% of cells displayed ZapA-GFP localized to mid-cell (these were cells that were actively undergoing cell division (Figure 4G–G’, arrow) and 37% of cells displayed ZapA-GFP as a ring that corresponded to the subsequent plane of cell division in daughter cells that had recently completed cytokinesis (Figure 4G–G’, arrowhead; n = 200). In contrast, in cells harboring inducible gpsB, addition of inducer resulted in the enlargement of cells and ZapA-GFP was mis-localized in 86% of the enlarged cells (n = 100; Figure 4H–I’). Assuming that the FtsZ bundling activity of ZapA is not synergistically participating with GpsB overexpression, this suggests that the cell enlargement phenotype caused by overproduction of GpsB was due to the mis-assembly of the divisome. To determine the behavior of the divisome in GpsB-depleted cells, we monitored the localization of ZapA-GFP. In cells harboring empty vector, ZapA-GFP localized to mid-cell in 82.5% of the cells (n = 200; Figure 4J–J’). Quantification of fluorescence intensity in individual cells revealed that the fluorescence of mid-cell-localized ZapA-GFP was 2429 ± 1346 units/cell (n = 75). At earlier time points after induction to deplete GpsB, before cell lysis, we observed faint ZapA-GFP signals at mid-cell in 41% of the cells and diffuse localization in the remaining cells (n = 200; Figure 4K–K’), but the mean fluorescence intensity of the ZapA-GFP ring structure (614 ± 450 units/cell; n = 75) was nearly four-fold lower than that observed for ZapA-GFP intensity in the absence of gpsB depletion. Together, the observations suggest that divisome assembly and GpsB localization are reciprocally influenced: GpsB requires FtsZ for localization to mid-cell; overproduction of GpsB disrupts divisome assembly; and depletion of GpsB prevents robust divisome assembly at mid-cell that precedes membrane deformities that ultimately lead to cell lysis. To test if GpsB directly influences FtsZ behavior, we purified recombinant S. aureus FtsZ, GpsB, and GpsBL35S (Figure 5A) and examined the GpsB variants by size exclusion chromatography (Figure 5B). GpsB eluted in two peaks by size exclusion chromatography, which approximately corresponds to the predicted sizes of hexameric (Rismondo et al., 2016) and dodecameric GpsB (Figure 5B, top), indicating that S. aureus GpsB could potentially exist in two forms. In contrast, GpsBL35S eluted exclusively as a dodecamer (Figure 5B, bottom), suggesting that its inability to form hexamers could underlie its loss of function in vivo. GpsB stimulates GTPase activity of FtsZ in vitro. (A) Coomassie-stained gel of purified FtsZ, GpsB, and GpsBL35S. (B) Size exclusion chromatograms of purified GpsB (top) or GpsBL35S (bottom). Predicted multimerization states of the purified protein, based on migration of MW standards, is indicated above peaks (12X, dodecamer; 6X, hexamer). Shown is a representative example of at least 3 independent purifications. (C) Initial velocities of GTP hydrolysis by FtsZ as a function of time at various FtsZ concentrations. (D) GTP hydrolysis turnover rate of FtsZ as a function of FtsZ concentration. (E) GTP hydrolysis of increasing concentrations of GpsB alone (▲) or 30 μM FtsZ in the presence of increasing GpsB concentrations (●). Error bars represent SEM (n = 3). (F) Median GTP hydrolysis rates of 30 μM FtsZ and 10 µM FtsZ in the absence and presence of 10 μM GpsB or GpsBL35S. The ends of the boxes represent the first and third quartile of measurements; bars represent the entire range of measurements; line indicates median value; ‘+' indicates mean value (n = 3). We next measured the GTP hydrolysis activity of purified S. aureus FtsZ with time at increasing protein concentrations. Unlike the well-characterized E. coli FtsZ, which robustly hydrolyzes GTP (Arjes et al., 2015; Buske and Levin, 2012; Mukherjee and Lutkenhaus, 1998; Romberg and Levin, 2003), S. aureus FtsZ hydrolyzed GTP poorly below ~30 μM (Figure 5C) (Anderson et al., 2012). The rate of hydrolysis continued to increase with FtsZ concentration (Figure 5D), displaying a behavior more similar to FtsZ from the Gram-positive Streptococcus pneumoniae, which has a critical concentration above 10 µM, than to E. coli FtsZ (although a lag observed for S. pneumonia FtsZ was not detected for S. aureus FtsZ) (Salvarelli et al., 2015). It should be noted that this result contrasts with that of Elsen et al., which reported a low critical concentration for S. aureus FtsZ (~5 µM) (Elsen et al., 2012). However, a recent report by Wagstaff et al. showed GTP hydrolysis rates at high S. aureus FtsZ concentration (10 and 20 µM), and similar to the rates reported here (Wagstaff et al., 2017). These differences could be due to varying populations of conformationally active FtsZ in different preparations (Elsen et al., 2012). We next measured the effect of GpsB on the GTP hydrolysis rate of FtsZ. Incubation of 30 µM FtsZ with increasing amounts of GpsB resulted in a non-linear stimulation of GTP hydrolysis activity, wherein appreciable stimulation of GTP hydrolysis was only seen above 8 μM GpsB (Figure 5E). At 10 µM GpsB (1:3 ratio of monomeric GpsB:FtsZ; 1:18 ratio of hexameric GpsB:FtsZ; 1:36 ratio of dodecameric GpsB:FtsZ), GTP hydrolysis was stimulated ~3 fold. As a control, GpsB alone did not exhibit appreciable GTPase activity (Figure 5E). 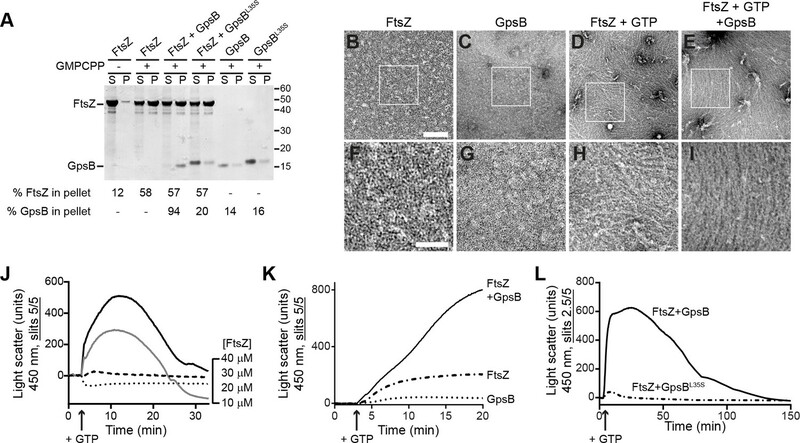 In contrast, incubation of FtsZ with GpsBL35S did not appreciably stimulate GTPase activity of FtsZ (Figure 5F), nor did the addition of GpsB, even at equimolar amounts, to lower concentrations (10 µM) of FtsZ. 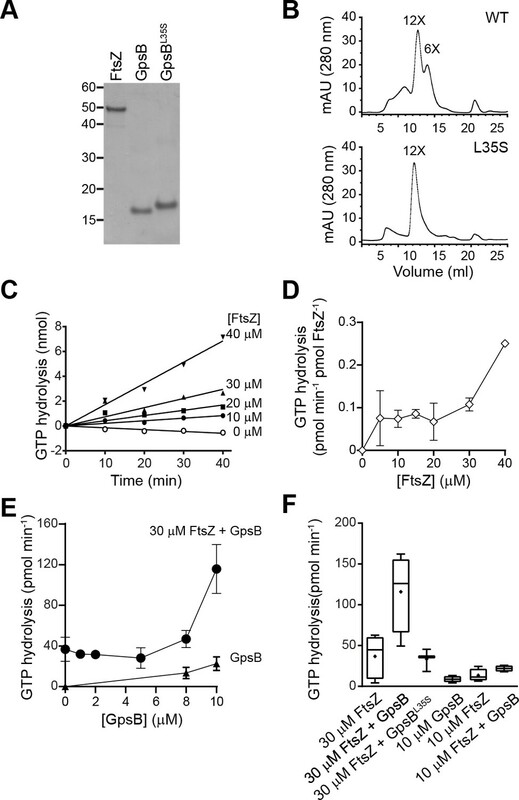 Thus, wild type GpsB, which purifies as a hexamer and dodecamer, stimulates the GTPase activity of FtsZ at substoichiometric levels at sufficiently high enough concentrations of FtsZ (above 30 μM), whereas GpsBL35S, which is locked in the dodecameric form, fails to do so. We next investigated if GpsB directly interacts with polymerized FtsZ using a high-speed sedimentation assay performed with a non-hydrolyzable GTP analog (GMPCPP), which promotes the assembly of stable FtsZ polymers. In the absence of nucleotide, FtsZ was largely detected in the supernatant after ultracentrifugation, but in the presence of GMPCPP, more than 50% of FtsZ was detected in the pellet fraction, indicating that it had polymerized (Figure 6A). When GpsB was incubated with the reaction, 94% of GpsB co-sedimented with FtsZ, whereas only 20% of the nonfunctional GpsBL35S co-sedimented with FtsZ. Finally, in the absence of FtsZ, GpsB and GpsBL35S were largely soluble, suggesting that GpsB, but not GpsBL35S, interacts with FtsZ polymers. To test if GpsB altered the ultrastructure of assembled FtsZ, we repeated the centrifugation at a slower speed to distinguish between individual or short FtsZ polymers and larger supramolecular assemblies of FtsZ. At a slower centrifugation speed, we detected 43% of FtsZ in the pellet fraction in the presence of GMPCPP (Figure 6—figure supplement 1A). Addition of GpsB increased the fraction of FtsZ in the pellet to 55%, whereas addition of GpsBL35S did not significantly alter the pelleted fraction of FtsZ. In the presence of GTP, 29% of FtsZ was detected in the pellet fraction (Figure 6—figure supplement 1B), and this fraction increased to 39% in the presence of GpsB, but not GpsBL35S. The differential centrifugation patterns suggested that direct interaction with GpsB could alter the assembly of FtsZ polymers. GpsB bundles FtsZ polymers in vitro. (A) Co-sedimentation of GpsB with polymerized FtsZ in vitro. 30 μM FtsZ were incubated in the presence or absence of GMPCPP, and 10 μM GpsB or GpsBL35S as indicated. Polymerized FtsZ was collected by ultracentrifugation and proteins in the resulting supernatant (S) and pellet (P) were separated by SDS-PAGE and detected by Coomassie staining. Percentage of total FtsZ or GpsB in the pellet are indicated below. Migration of MW markers are indicated to the right. Shown is a representative gel of 3 independent replicates. (B–E) Morphology of (B) purified FtsZ, (C) purified GpsB, (D) polymerized FtsZ incubated with GTP, or (E) polymerized FtsZ incubated with GTP and GpsB visualized using negative stain transmission electron microscopy. Scale bar: 200 nm. (F–I) magnified views of the areas indicated in (B–E), respectively. Scale bar: 100 nm. (J) Assembly of 10 µM (dotted trace), 20 µM (dashed), 30 µM (gray) or 40 µM (black) FtsZ measured using 90° angle light scattering. (K) FtsZ assembly in the presence (solid) or absence (dash-dot) of GpsB, or GpsB alone (dotted), measured by 90° angle light scattering. (L) Assembly and disassembly of FtsZ in the presence of limiting amount of GTP monitored by 90° angle light scattering. Time of GTP addition is indicated with an arrow. Note the difference in slit width in (L). Shown are representative traces of at least 3 independent experiments. To visualize the morphology of purified FtsZ polymers with and without GpsB, we examined purified proteins in the presence and absence of GTP using negative stain transmission electron microscopy (TEM). Purified FtsZ or GpsB alone did not show any distinguishable structures by TEM (Figure 6B–C,F–G). In the presence of GTP, FtsZ formed linear polymers,~100 nm in length, that were abundant and scattered in different directions on the grid, indicating that it had polymerized successfully in a GTP-dependent manner (Figure 6D,H). In the presence GpsB and GTP, however, FtsZ polymers formed long filaments, closer to 1 µm in length, which were oriented in a similar direction (Figure 6E,I). This pattern of orientation on an EM grid was reminiscent of the bundling behavior reported previously for proteins in E. coli that could promote lateral interactions between FtsZ filaments in vitro (Hale et al., 2000; Small et al., 2007). With GMPCPP, FtsZ polymers were very long and in the presence of GpsB also exhibited extensive lateral interactions between FtsZ filaments, indicating that GpsB-mediated bundling of FtsZ did not require GTP hydrolysis (Figure 6—figure supplement 1C–E). We next monitored the kinetics of FtsZ assembly in vitro using 90° angle light scattering (Mukherjee and Lutkenhaus, 1999) as a function of FtsZ concentration. Incubation of either 10 µM or 20 µM purified S. aureus FtsZ with GTP did not result in an appreciable increase in light scattering (Figure 6J), consistent with the apparent high critical concentration for FtsZ assembly suggested in GTP turnover experiments (Figure 5C–D). Incubation of 30 µM or 40 µM FtsZ with GTP resulted in a rapid increase in light scattering that likely corresponds to the assembly of FtsZ polymers. The increase was followed by a brief plateau, likely reflecting that the reaction was at steady state, then a decrease in light scattering, corresponding to disassembly of FtsZ polymers coincident with depletion of GTP in the reaction. Such kinetics were not detected when 30 µM FtsZ was incubated with GDP, ATP, or ADP (Figure 6—figure supplement 2A), suggesting that the light scattering assay specifically reflects GTP-dependent dynamics of FtsZ assembly. To confirm that the decrease in light scattering corresponded to the depletion of GTP and accumulation of GDP in the reaction, we repeated the assay in the presence of a regeneration system to replenish GTP. As expected, addition of a GTP regeneration system prevented the rapid loss of scatter following the plateau (Figure 6—figure supplement 2B), suggesting that the decrease in Figure 6J represents the disassembly of FtsZ polymers as GTP becomes limiting. Next, we tested the effect of GpsB on FtsZ assembly. Addition of 10 µM GpsB to the reaction with GTP and 30 µM FtsZ resulted in an initial increase in light scattering that was much more rapid and larger in amplitude than that of FtsZ alone in the presence of GTP (Figure 6K), whereas incubation of GpsB alone with GTP did not result in an increase in light scattering. To determine if the increase in light scattering due to GpsB was reversible, we followed the assembly reaction for a longer period (Figure 6L). Upon addition of GTP, the reaction containing FtsZ and GpsB displayed a rapid increase in light scattering, which was not observed when FtsZ was incubated with GpsBL35S. Note that, due to saturation of the detector in the presence of GpsB, the slit width in Figure 6L was adjusted, precluding a direct comparison between the signal amplitudes shown in Figure 6J K. After reaching a plateau, the reaction containing WT GpsB displayed a steady decrease in light scattering, suggesting that the assembly of the higher order FtsZ structures generated in the presence of GpsB was reversible, in contrast to the behavior of other FtsZ bundling proteins reported in other systems. We therefore conclude that GpsB directly interacts with polymerized FtsZ and bundles FtsZ filaments. Taken together with the observation that GpsB also triggers GTP hydrolysis by FtsZ, we propose that FtsZ bundling by GpsB increases FtsZ local concentration and triggers GTP hydrolysis which, in the light scattering assay, is linked to the disassembly of FtsZ polymers as GTP is depleted. Since binary fission has been traditionally studied in rod-shaped model organisms, the roles of factors that participate in cell division of spherical bacteria have been less well characterized (Eswara and Ramamurthi, 2017). In this report, we investigated the role of a coiled-coil protein, GpsB, during cell division in the spherical bacterium S. aureus. Unlike the orthologs of GpsB in other systems, we report that GpsB directly interacts with FtsZ, the core component of the bacterial cell division machinery and increases the GTPase activity of FtsZ. We also demonstrate that GpsB promotes bundling of FtsZ filaments in vitro. We propose a model in which the bundling of S. aureus FtsZ by GpsB raises the local concentration of FtsZ transiently so that it may robustly hydrolyze GTP, and thereby participates in remodeling the constricting divisome during cytokinesis. A recent report suggested that cell division in S. aureus proceeds in two principal steps: an initial FtsZ treadmilling-dependent step in which membrane invagination initiates, followed by recruitment of peptidoglycan remodeling enzymes by later arriving divisome components that mediates the progression and completion of cell division (Monteiro et al., 2018). We propose that GpsB may participate in the initial step that stabilizes FtsZ at mid-cell and activates GTP hydrolysis (by increasing the local concentration of FtsZ via a bundling-like mechanism) to trigger FtsZ treadmilling, which is linked to constriction of the membrane and concurrent peptidoglycan synthesis (Bisson-Filho et al., 2017; Yang et al., 2017). In our model, FtsZ requires a high concentration to polymerize and to hydrolyze GTP efficiently. In the presence of GpsB, though, FtsZ filaments are laterally bridged to form higher order supramolecular structures (Figure 7A). Intracellular levels of FtsZ and GpsB are reported to be approximately 4452 and 1659 molecules per cell, respectively (Zühlke et al., 2016) (S. Fuchs, personal communication). Considering a cell diameter of 0.8 µm, this equates to intracellular concentrations of 28 uM FtsZ and 10 uM GpsB and corresponds closely with our in vitro reaction conditions. Model of GpsB remodeling of FtsZ in S.aureus. (A) Molecular model. FtsZ (green) filaments, which form upon GTP binding, directly interact with GpsB (red). 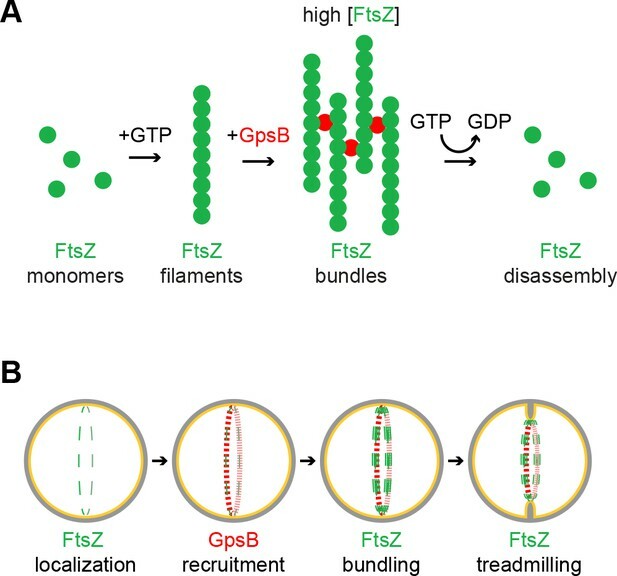 Filament-bound GpsB molecules promote lateral interactions between FtsZ filaments, thereby raising the local concentration of FtsZ, which drives GTP hydrolysis that leads to FtsZ disassembly. (B) Cellular model. FtsZ (green) ring localizes at mid-cell and recruits GpsB (red), which initially drives lateral interactions between FtsZ filaments to promote Z-ring stabilization at that position. Subsequent stimulation of FtsZ GTP hydrolysis, caused by a local increase in FtsZ concentration, stimulates FtsZ treadmilling which is linked to membrane constriction and concurrent peptidoglycan synthesis at mid-cell. We show that GpsB is a multimer and propose that it may harbor 6–12 binding sites per multimer to recruit and bridge multiple FtsZ proteins. We propose that the bridging of FtsZ filaments also serves to increase the local FtsZ concentration and enhances GTP hydrolysis. 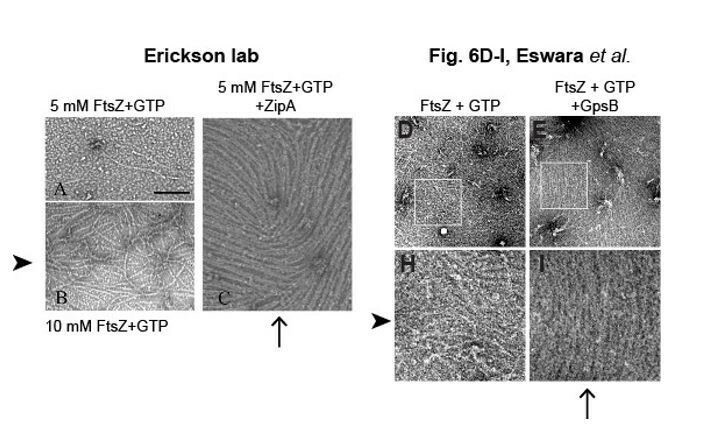 Unlike other proteins that bundle FtsZ irreversibly in vitro by inhibiting GTP hydrolysis, incubation with GpsB ultimately allows for the subsequent disassembly of FtsZ polymers once GTP is depleted (Figure 7A). To our knowledge, this is the first report of an FtsZ regulatory protein that promotes both lateral interactions between FtsZ filaments while also stimulating GTP hydrolysis. Furthermore, considering the intracellular concentrations of FtsZ and GpsB and what we have observed biochemically, FtsZ polymers and regulators appear poised at the threshold between assembly and disassembly, enabling tight control over the division process. Our view is supported by multiple lines of evidence. First, overexpression of gpsB resulted in the enlargement of S. aureus cells, reminiscent of the phenotype caused by depletion of FtsZ (Pinho and Errington, 2003), likely due to increased FtsZ GTPase activity leading to the inability of FtsZ to polymerize and treadmill in a concerted fashion. Curiously, overexpression of S. aureus gpsB in B. subtilis, but not the B. subtilis gpsB ortholog, resulted in filamentation, suggesting that S. aureus GpsB harbors a unique cell division-modulating activity that is not exhibited by the B. subtilis version. Second, depletion of GpsB in S. aureus resulted in the arrest of cytokinesis and abrogation of initiation of cell division. Third, we observed that GpsB co-localized with the cell division machinery at the onset of cytokinesis, and co-constricted with the invaginating membrane during cell division, consistent with its role in modulating the activity of FtsZ. Fourth, we found that purified GpsB directly interacted with FtsZ in vitro and stimulated the GTPase activity of FtsZ, consistent with the ability of GpsB to inhibit cell division in vivo when overproduced. Finally, when incubated with FtsZ in vitro, GpsB promoted lateral interactions between FtsZ polymers, but also allowed for the ultimate disassembly of FtsZ in vitro once GTP had been depleted. Our genetic, cytological, and biochemical data in sum suggest a model in which Staphylococcal FtsZ begins assembling at mid-cell and recruits GpsB to that location (Figure 7B) where GpsB stabilizes the Z-ring via a bundling-like mechanism that concentrates and organizes FtsZ polymers. We propose that this reinforces the faithful and robust assembly of FtsZ at mid-cell at the onset of cell division and drives an increase in the local concentration of FtsZ, which stimulates its GTPase activity, which is linked to treadmilling- an activity that is likely coincident with the initial membrane constriction that initiates cytokinesis. After completion of cytokinesis, GpsB redistributes to the cell periphery and awaits the next round of cell division. It is tempting to speculate that this dynamic redistribution of GpsB, presumably coincident with a dynamic ability to modulate FtsZ activity, is dependent on the multimerization state of GpsB. In this way, the hexameric and dodecameric populations of purified GpsB could represent the active and inactive forms, respectively, of the protein that may mediate its interaction with FtsZ. Consistent with this model, the inactive GpsBL35S was locked in the dodecameric form and did not exhibit the dynamic redistribution from the cell periphery to the cell division site in vivo. Identifying the factors that regulate the multimerization state of GpsB could therefore provide an understanding into the temporal regulation of cell division in S. aureus. Interestingly, depletion of a known interaction partner of GpsB, EzrA, also leads to cell enlargement, hinting at a possible collaboration between these two proteins in regulating cell division (Jorge et al., 2011; Steele et al., 2011). Several divisome proteins in E. coli and B. subtilis that positively regulate cell division by bundling FtsZ polymers do so via inhibition of FtsZ GTPase activity (Durand-Heredia et al., 2011; Hale et al., 2011; Lutkenhaus et al., 2012; Mohammadi et al., 2009; Pacheco-Gómez et al., 2013; Singh et al., 2008; Small et al., 2007; Tsang and Bernhardt, 2015). In our model, the seemingly contradictory observation that GpsB stimulates GTP hydrolysis, even though it promotes FtsZ bundling may be explained by the proposition that FtsZ bundling is not the ultimate activity of GpsB. Rather, we envision that FtsZ bundling is an intermediate step that increases local FtsZ concentration to stimulate GTP hydrolysis (Figure 7A). This set of opposing activities exhibited in S. aureus in a single protein is reminiscent of the model in E. coli, where FtsZ polymers bundled by other proteins require a separate protein, FtsA, that can disrupt the bundles and destabilize FtsZ polymers (Conti et al., 2018; Krupka et al., 2017). In a slight variation of this model, since FtsZ bundling in B. subtilis requires C-terminal positively charged residues (Buske and Levin, 2012), it is conceivable that GpsB modulates exposure of the C-terminus of FtsZ to promote FtsZ self-interactions or remodels FtsZ to stabilize a conformation associated with enhanced GTP hydrolysis. 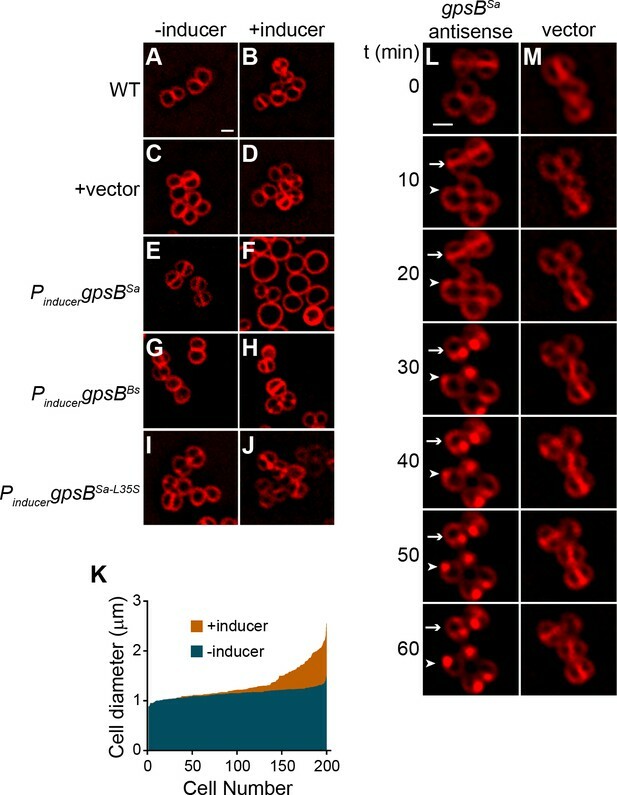 In this way, GpsB, an essential S. aureus protein, may orchestrate the organization, stabilization, and activity of FtsZ to remodel the divisome during cell division. B. subtilis strains used in this study are derivatives of PY79 (Youngman et al., 1984), and S. aureus strains are derivatives of SH1000 (Horsburgh et al., 2002). To overproduce GpsB or GpsB-GFP orthologs in B. subtilis, gpsB (HindIII/SphI; primers oP36/oP38, please see Key Resources Table for primers) or gpsB-gfp (HindIII/NheI; oP36/37 for gpsB without stop codon; and NheI/SphI; oP46/24 for gfp with stop codon) were PCR amplified and cloned into the 5’ HindIII and 3’ NheI restriction sites in pDR111 (D. Rudner) to place it under control of the isopropyl β-D-1-thiogalactopyranoside (IPTG)-inducible Phyperspank promoter. The resulting plasmids (pGG3, gpsB; pGG4, gpsB-gfp) were integrated into the amyE locus in the B. subtilis chromosome by double recombination. Similarly, B. subtilis gpsB was constructed using primers oP100/102 (gpsB; SalI/NheI) and gpsB-gfp was constructed by ligating the products of oP100/101 (gpsB no stop codon; SalI/NheI) and oP46/24 (gfp; NheI/SphI). To produce S. aureus GpsB or GpsB-GFP in S. aureus, gpsB or gpsB-gfp were PCR amplified and cloned into the 5’ HindIII and 3’ SphI restriction sites in the pCL15 plasmid (Luong and Lee, 2006), downstream of the IPTG-inducible Pspac promoter, to create pPE45 and pPE46, respectively. The L35S substitution was introduced using the QuikChange Site-Directed Mutagenesis kit (Agilent) using pPE45, pPE46, pGG3, or pGG4 as a template. To express B. subtilis gpsB in S. aureus, a pCL15-based vector pPE83 was constructed by amplifying and inserting the B. subtilis gpsB fragment with the help of primer pairs oP100/195 (SalI/BamHI). To express the antisense RNA of the gpsB open reading frame and ribosome binding site under control of a xylose-inducible promoter, using primers oP187/188 abutted by EcoRI and BamHI restriction sites and cloned into plasmid pEPSA5 (Forsyth et al., 2002) to create plasmid pGG59. Plasmid pRB42 (zapA-gfp) was constructed using primers oP236/237 (zapA no stop codon; SalI/NheI) and oP46/47 (gfp; NheI/BamHI) and inserted into cadmium-inducible plasmid pJB67 (Windham et al., 2016). Plasmids were first introduced into S. aureus RN4220 by electroporation, then transduced into strain SH1000. Expression was induced by addition of 1 mM IPTG or 1% xylose or 1.25 µM CdCl2, as required, in the growth medium. For immunoblot analysis of cell extracts, overnight cultures of S. aureus were diluted 1:50 into 10 ml tryptic soy broth (TSB) and were grown to mid-logarithmic phase, harvested by centrifugation, and resuspended in 1 ml buffer A (see below) containing 200 mM KCl, 1 mM dithiothreitol, and 10 mg/ml lysostaphin and incubated for 15 min at room temperature. Suspensions were then sonicated (3 intervals at 10 s each at 20% power level), then cleared by centrifugation at 14,000 × g for 10 min. Supernatants were isolated and centrifuged at 100,000 × g for 1 hr to separate soluble (supernatant) fraction from insoluble (pellet) fraction. Supernatants were removed for analysis. Pellets were resuspended in 1 ml buffer (no lysostaphin) containing 0.01% SDS. Samples were separated using 8–16% SDS-PAGE (BioRad), transferred to nitrocellulose membrane, and probed with rabbit antisera raised against purified S. aureus GpsB or B. subtilis SigA antibody. Overnight B. subtilis cultures grown at 22°C in Luria-Bertani (LB) medium were diluted 1:20 into fresh LB medium and grown for 2.5 hr at 37°C. Overnight cultures of S. aureus in TSB, containing 15 μg/ml chloramphenicol and/or 5 μg/ml erythromycin for plasmid maintenance if necessary, were diluted into fresh medium and grown to mid-logarithmic phase. 1 mM IPTG was added as required for 3 hr. 1 ml cultures were washed with PBS and resuspended in ~100 μl PBS containing 1 μg/ml fluorescent dye FM4-64 and/or 2 μg/ml DAPI to visualize membranes and DNA, respectively. 5 μl was spotted on a glass bottom culture dish (Mattek) and covered with a 1% agarose pad made with distilled water and imaged at 25°C. For time lapse, a 5 μl aliquot of SH1000 pGG59 cells grown in TSB/chloramphenicol until mid-log phase was spotted on a glass bottom culture dish and covered with an agarose pad made with TSB/chloramphenicol containing 1% xylose to induce expression of the gpsB antisense RNA. After 20 min of equilibration in the microscopy environmental chamber, images were obtained at 15 min intervals for 4 hr at 25°C. For FtsZ inhibition experiments, mid-log phase cells were incubated with 2 μg/ml PC190723 and samples for imaging were collected after 3 hr. Cells were viewed with a DeltaVision Core microscope system (Applied Precision/GE Healthcare) equipped with a Photometrics CoolSnap HQ2 camera and an environmental chamber. Seventeen planes for standard microscopy and four planes for time-lapse microscopy were acquired every 200 nm, and the data were deconvolved using SoftWorx software as described previously (Tan et al., 2015). For structured illumination microscopy, cells were viewed using a DeltaVision OMX (Applied Precision/GE Healthcare) comprising an OMX optical microscope (version 4), equipped with a sCMOS camera. To purify FtsZ, S. aureus ftsZ was PCR amplified and cloned into the pET28a(+) vector (EMD Millipore) using 5’ NdeI and 3’ XhoI restriction sites, resulting in the addition of an N-terminal histidine tag followed by a thrombin cleavage site. Expression was induced in BL21(λDE3)::ΔclpP cells grown in LB broth supplemented with 50 μg/ml Kanamycin for plasmid maintenance, at 30°C by adding 1 mM IPTG after cells reached an optical density (600 nm) of 1.0. Cells were harvested by centrifugation, resuspended in buffer A [20 mM HEPES (pH 7.5), 50 mM KCl, 5 mM MgCl2 and 10% glycerol], and lysed by French press. Soluble extract was collected by centrifugation at 30,000 × g for 30 min at 4°C and applied to an IMAC column (TALON Superflow, GE Healthcare), and washed with Buffer A containing 10 mM imidazole. Untagged FtsZ was eluted with thrombin (4 U; Novagen) and then 0.5 mM phenylmethylsulphonyl fluoride was added to inactivate thrombin. To purify GpsB-His6, S. aureus gpsB was PCR amplified and cloned into pET28a(+) using 5’ XbaI and 3’ BamHI restriction sites, using primers to append a His6 tag to the C-terminus. Overproduction of GpsBSa-His6 in B. subtilis resulted in cell filamentation similar to untagged GpsBSa, suggesting that the His6-tagged protein was functional. The L35S substitution was introduced using the QuikChange Site-Directed Mutagenesis kit (Agilent). Expression was induced in BL21(λDE3)::ΔclpP cells grown in LB broth supplemented with 25 μg/ml Kanamycin for plasmid maintenance, at 37°C by adding 0.5 mM IPTG for 2 hr after cells reached an optical density (600 nm) of 0.6. Cells were harvested by centrifugation and resuspended in 30 ml cold buffer B [50 mM sodium phosphate (pH 8.0), 500 mM NaCl, 20 mM imidazole, 1 mM EDTA, 10% Glycerol, 3 mM DTT] and lysed by sonication (5 s on/10 s off cycle for 5 min). Lysate was cleared by centrifugation for 30 min at 40,000 × g; cleared lysate was passed through a Ni2+-NTA column equilibrated with buffer B, washed with 20 column volumes buffer B, and eluted with buffer B containing 200 mM imidazole. Imidazole was removed with a PD10 desalting column and eluted with buffer A containing 250 mM KCl and 1 mM DTT. To ensure the final buffer composition the protein was dialyzed over night at 4°C against buffer A.
FtsZ assembly was monitored by 90° angle light scattering using an Agilent Eclipse fluorescence spectrophotometer with excitation and emission wavelengths set to 450 nm and slit widths of 5/5 or 2.5/5, where indicated. FtsZ (30 μM) was added to reactions (80 μl) containing assembly buffer (20 mM HEPES pH 7.5, 140 mM KCl, 5 mM MgCl2) with and without GpsB or GpsBL35S (1 or 10 μM), where indicated. Baseline readings were collected for 3 min, 2 mM GTP was added and light scattering was measured for up to 300 min. GMPCPP-stabilized FtsZ polymers were assembled by incubating FtsZ (30 μM) with 0.5 mM GMPCPP in the absence and presence of GpsB or GpsBL35S (10 μM) for 10 min and collected by centrifugation either for 30 min at 129,000 x g (Figure 6A), 20 min at 20,000 x g, or 20 min at 90,000 x g (Figure 2—figure supplement 1A–B), as indicated. Where indicated, polymerization was stimulated with GTP (2 mM) and a nucleotide regenerating system containing acetate kinase (25 μg ml−1) and acetyl phosphate (15 mM) was included to prevent GDP accumulation. Supernatants and pellets were resuspended in equivalent volumes of LDS sample buffer (Life Technologies) and analyzed by SDS-PAGE and Coomassie staining. The relative amounts of FtsZ, GpsB and GpsBL35S in supernatant and pellet fractions were quantified by densitometry using ImageJ (NIH). FtsZ GTP hydrolysis activity was monitored by detection of free phosphate using Biomol Green (Enzo Life Sciences). Reactions containing FtsZ (0–40 μM) in the absence and presence of GpsB and GpsB(L35S) (0–10 μM) were incubated with 2 mM GTP in assembly buffer at room temperature. Phosphate was measured at 0 and 15 min by comparison to a phosphate standard curve. Rates were calculated by measuring the amount of free phosphate released during the incubation period. At low FtsZ concentrations, reactions were incubated for 60 min. FtsZ (30 μM) polymers were assembled in buffer (20 mM HEPES pH 7.5, 140 mM KCl, 5 mM MgCl2) in the presence or absence of GpsB (10 μM) by addition of 2 mM GTP. After 10 min, reactions were applied to formvar/carbon coated 300 mesh grids, fixed with 2.5% glutaraldehyde in 0.15M sodium cacodylate buffer (pH 7.4) and stained with 2% aqueous uranyl acetate. Samples were imaged by transmission electron microscopy using a FEI Tecnai G2 Spirit BioTWIN 80Kv instrument equipped with a SIS Morada 11 Megapixel camera. Journal of Biological Chemistry 285:14239–14246. Journal of Biological Chemistry 287:10945–10957. Journal of the American Chemical Society 134:12342–12345. Annual Review of Microbiology 71:393–411. The Journal of Infectious Diseases 193:172–179. Nature Reviews Drug Discovery 7:324–338. Nature Reviews Molecular Cell Biology 6:862–871. Expert Review of Anti-infective Therapy 11:297–308. Annual Review of Microbiology 57:125–154. Philosophical Transactions of the Royal Society B: Biological Sciences 370:20150028. Journal of Biological Chemistry 290:25081–25089. Current Opinion in Microbiology 16:522–530. Journal of Biological Chemistry 283:31116–31124. Journal of Molecular Biology 369:210–221. Current Opinion in Microbiology 24:60–65. Thank you for submitting your work entitled "An essential Staphylococcus aureus cell division protein regulates assembly and disassembly of FtsZ" for consideration by eLife. Your article has been reviewed by three peer reviewers, and the evaluation has been overseen by a Reviewing Editor and a Senior Editor. The reviewers have opted to remain anonymous. While the three reviewers note that discovering the function of GpsB in cell division would be an important finding for the field, all feel that the study it is not sufficiently advanced to support the conclusions. In particular, effects other than interference with FtsZ polymerization could explain the cell biology phenotypes, and the biochemical characterization of GpsB is insufficiently advanced to justify the conclusions. Specifically, the reviewers do not feel that the in vitro data show unequivocally that GspB is an FtsZ-bundling factor and alternative explanations are possible. Last, the proposed constriction model is at odds with recent work suggesting that FtsZ might rather distribute peptidoglycan synthesis along the septal ring. Given the extent of the requested modifications, we have no choice but to reject the manuscript. The individual reviews are provided below to help you prepare the manuscript for another journal. In this manuscript, the authors analyze the function of the GpsB protein in S. aureus. GpsB and its paralog DivIVA are well-studied in Firmicutes and Actinobacteria. In these species, these two proteins have been shown to be involved in regulation of cell growth, regulation of cell division and/or in chromosome segregation. Here, it is reported that overproduction of GpsB from S. aureus in B. subtilis gives rise to filamentous cells; overproduction of GpsB in S. aureus gives rise to large spherical cells; depletion of GpsB in S. aureus results in inhibition of cell division; a gspB mutation is isolated that does not affect cell shape upon expression in B. subtilis; GpsB localization is determined and found to be dynamic over the cell cycle: and, that GpsB interacts with FtsZ in vitro. Previously, it has been reported that GpsB is essential in S. aureus. This manuscript aims to clarify the function of GpsB in S. aureus. The data presented present a good starting point for this clarification; however, as outlined below I have several major problems with the manuscript that will require additional experiments. In its current format, the data do not support the major conclusions. 1) In the Introduction it would be very helpful if an explanation was included for how DivIVA and GpsB proteins are defined and how they differ from each other. It is not clear that GpsB from S. aureus and B. subtilis accumulate at the same levels in the strains were the two proteins are overproduced. The multiple nucleoids in the filamentous B. subtilis cells formed after overproduction of GpsB from S. aureus are not clearly segregated. Therefore, it is not clear what actually causes the filamentous phenotype, i.e. does GpsB from S. aureus interfere with chromosome segregation or with cell division or both processes? Does overproduction of GpsB from S. aureus cause a filamentous phenotype in a B. subtilis strain that lacks the native GpsB or DivIVA? Please provide numbers for how many uninduced cells have septa and how many cell shave septa after induction of GpsB overproduction. The large cells formed after GpsB overproduction seem to be devoid of nucleoid. So more quantitative analyses using chromosomal markers need to be included to clearly demonstrate that chromosome segregation is normal. From the data provided it is not clear if overproduced GpsB interferes with chromosome segregation, cell division, cell growth or a combination of these processes. It is essential to include additional experiments to precisely define the process that overproduced GpsB interferes with is precisely defined. Please include experimental data to demonstrate that GpsB has been depleted in the experiments shown in Figure 2. Along the same lines, it seems that a construct in which expression of gpsB is regulated directly (and without the extra step with the antisense RNA) would be a more simple experimental setup. Only a few S. aureus cells seem to be affected in their cell shape in the depletion experiment shown in Figure 2A, B. More quantitative data are needed. From the experiments in Figure 2B it is by no means clear that chromosome segregation proceeds normally. In fact, it looks as if segregation has been halted. So, more quantitative analyses using chromosomal markers need to be included to clearly demonstrated that chromosome segregation is normal. As is the case for the overproduction experiment, it is not clear if the depletion phenotype is caused by defects in chromosome segregation, cell division, cell growth or a combination of these processes. It is essential to include additional experiments to precisely define the process that is affected upon GpsB depletion. What is the phenotype of the gpsBL35S mutant in S. aureus? The experiments nicely demonstrate that GpsB localize to the septum. Does this localization depend on FtsZ, i.e. what happens to GpsB localization upon depletion of FtsZ? To establish a more direct connection between cell division and GpsB it is essential to include experiments on Z-ring formation and localization in the strains overproducing GpsB or depleted for GpsB. Please use the same units in Figure C, D and E.
All experiments in Figure 5: Please include EM images to unequivocally demonstrate that FtsZ forms filaments and that these filaments are altered by GpsB. All experiments in Figure 5: Please include control experiments that the effect of GTP on FtsZ polymerization is specific to GTP. Eswara et al. describe analysis of the S. aureus homolog of GpsB, a protein implicated in varied aspects of cell division among the firmicutes. Using several approaches they come to the conclusion that in contrast to other bacteria, Sa GpsB interacts directly with the highly conserved cell division protein FtsZ to control its activity. I was initially enthusiastic about this study and its potential to define the function of GpsB, a protein whose true nature has been the source of significant debate in the field. Unfortunately, many of the experiments presented in this paper are poorly designed and the physiological relevance of the authors' findings is unclear. Experiments investigating the impact of GpsB on B. subtilis growth and division, the apparent inclusion of an N-terminal His tag on Sa FtsZ in sedimentation and light scattering experiments, and the extremely long duration of the light scattering assays (3 hours or ~6 S. aureus generations in rich medium), are particularly concerning. In addition, the model that GpsB stimulates constriction of the FtsZ ring (Figure 6) is at odds with recent work from the Garner and Xiao laboratories indicating that FtsZ forms treadmilling polymers that serve to time average peptidoglycan synthesis but does not contribute directly to constriction itself (PMID:26831086 PMID: 28209899 PMID: 28209898). On the whole, I did not find the data sufficient to support the authors' major conclusions, significantly detracting from my initial enthusiasm for this study. 1) The value of ectopic GpsB expression in B. subtilis is limited at best. It is not uncommon for cell division proteins from one organism to interfere with division in another due to minor differences in protein-protein interaction. The fact that S. aureus gpsB does not complement a loss of function mutation in B. subtilis gpsB reinforces this point. GpsB depletion and overexpression in S. aureus, should be more than sufficient to prove their point provided they add additional information on FtsZ assembly in the different mutant strains. 2) In the absence of data indicating that excess GpsB and/or GpsB depletion disrupts FtsZ localization, I do not think that the authors can fairly conclude that GpsB inhibits FtsZ assembly in vivo. It is equally plausible that changes in GpsB impact the localization or activity of a downstream cell division protein. 3) Evidence for GpsB promoting lateral interactions between FtsZ polymers is limited to light scattering experiments that show increased signal when GpsB is added to FtsZ in vitro. Light scattering does not distinguish between differentiate between the formation of a few large protein complexes and the formation of a high number of smaller complexes (e.g. in the case of FtsZ large bundles or lots of single stranded polymers). 4) A better way to show GpsB driving lateral interaction is to add purified GpsB to FtsZ + GTP to determine if it a) increases pellet size in a sedimentation experiment and b) leads to the formation of bundles of single stranded polymers by EM. 5) The authors use the term polymerization when I believe they mean assembly. None of the assays they employ truly distinguish between polymerization-the formation of single stranded FtsZ polymers-and bundling-the formation of bundles of single stranded polymers via lateral interactions. Assembly is a generic term that the field uses to describe both phenomena. 6) I cannot find any information regarding GpsB protein concentration either in wild type cells or in overexpression strains. Such data is essential both for the reader to evaluate the impact of GpsB overexpression on S. aureus division and to support the physiological relevance of in vitro work. 7) For E. coli and B. subtilis FtsZ the leveling out in 90-degree angle assembly assays indicates that the reaction is at steady state with regard to polymerization and depolymerization. It does not mean that the polymers are "stable". 8) The concentration of Sa FtsZ used for in vitro experiments is quite high. In previous studies, Sa FtsZ activity was measured at 10μM (PMID: 22958099). The authors are encouraged to use FtsZ at as low a concentration as possible-ideally near its in vivo concentration-to avoid artifacts. 9) I was confused by the use of the His tag for purification of Sa FtsZ. Was this removed prior to analysis? If not, is the tagged version able to complement depletion of native Sa FtsZ in vivo? It is straightforward to purify native Sa FtsZ (see PMID 22958099), which is far preferable to the tagged version for in vitro analysis. 10) It is highly unlikely, if not physically impossible, for a protein that stimulates lateral interactions to enhance GTP hydrolysis. Lateral interactions stabilize FtsZ polymers, restricting nucleotide turnover and inhibiting hydrolysis. 11) The long (180 minute) delay between achievement of steady state and disassembly does not support the authors conclusion that Sa GpsB stimulates first bundle formation and then disassembly in vivo where FtsZ monomer turnover is likely on the order of seconds or minutes. 12) The time frames of the GTPase assays and the 90-degree angle light scattering experiments differ substantially. If the conditions of the two assays are the same and the authors' model is correct, the expectation is that GTP hydrolysis rates would be bimodal with a low rate early in the experiment (corresponding to high levels of light scattering and polymer bundling) and with a short burst of increased rates of GTP hydrolysis at the end (corresponding to disassembly). 13) The authors are encouraged to use a regenerating GTP system to avoid accumulation of GDP over long time courses. GDP inhibits FtsZ-FtsZ interactions and its accumulation could very well be the cause of the rapid disassembly observed in the LS assays. 14) The authors should consider alternative hypotheses. In particular, their data is consistent with a scenario in which GpsB stimulates FtsZ polymerization, elevating the concentration of short FtsZ polymers (but not bundles). Increases in the numbers of short polymers is expected to increase light scattering AND increase rates of GTP hydrolysis due to increases in the number of polymer ends available for nucleotide exchange. This report describes the GpsB protein of Staphylococcus aureus, which, like some other GpsB homologs, is involved cell division. Although GpsB is not essential for viability in B. subtilis or some strains of S. pneumoniae, it is essential in S. aureus. Here, the authors explore why GpsB might be essential. They first show that overproduction of S. aureus GpsB inhibits septation in S. aureus (causing cell enlargement) as well as in B. subtilis (causing cell filamentation), and nucleoid segregation seems to be affected in both cases. Depletion of GpsB in S. aureus, on the other hand, results in lysis of some cells and production of some anucleate cells, which is interpreted here as a cell division timing defect. The authors then show that GpsB localizes to the leading edge of the division septum, and purified GpsB, which seems to form multimers, co-sediments and co-assembles with FtsZ. S. aureus FtsZ has a very low GTPase activity and a high critical concentration, similar to S. pneumoniae FtsZ. However, when FtsZ is at high concentration, purified GpsB can stimulate the GTPase activity 3-fold and promote massive bundling of the highly concentrated FtsZ. Finally, light scattering experiments suggest that GpsB not only stimulates massive assembly of FtsZ bundles, but also eventually promotes its disassembly. An intriguing model proposes that GpsB first bundles FtsZ, then after a while debundles (or disassembles) FtsZ polymers, making it a dual-function FtsZ assembly state regulator. Although the new information about S. aureus GpsB is interesting and welcome, particularly the direct interaction with FtsZ, this paper has a number of significant shortcomings. The main one is that the data do not provide sufficient support for many of the conclusions, including the regulation of assembly and disassembly of FtsZ described in the title. For example, key conclusions about FtsZ bundling and un-bundling are made from experiments with likely non-physiologically high levels of FtsZ (30 μM). The main conclusions about FtsZ bundling come from fluorescence experiments, but without inspection of these structures by EM, it is difficult to tell whether they are aggregates or bundles of protofilaments (especially as they are tens of microns in width, which would require thousands of FtsZ protofilaments to associate laterally). Moreover, there is no differentiation between "assembly" and "bundling". As the relevant experiments in vitro use sedimentation, fluorescence microscopy of labeled proteins, and light scattering, all the observed effects may be different degrees of FtsZ protofilament bundling. It is too bad that the authors did not include some TEM analysis, as this could allow them to make more specific conclusions about assembly state, including GpsB assembly state. As it is, the fact that they don't really know whether the effects are on FtsZ lateral interactions or longitudinal interactions should at the least be stated in the text. Another key conclusion, that GpsB promotes FtsZ disassembly, comes from a single experiment showing loss of light scattering from this very high concentration of FtsZ after incubation with GpsB. While the authors' conclusions may be correct, an alternative possibility is that the GTP was depleted. They mention use of a GTP regeneration system, but this system was not described or referenced, and there is no way to know whether such a regeneration system could be overwhelmed by 30 μm of assembled FtsZ that has been stimulated to hydrolyze GTP by GpsB. Finally, there is a disconnect between the in vivo and in vitro results. For example, the in vivo images focus mainly on the effects of too much or too little GpsB on the nucleoid or membrane integrity, whereas in vitro experiments focus on GpsB-FtsZ interactions. It would greatly strengthen the authors' case if they could better correlate their in vivo and in vitro data. For example, there is no attempt to localize FtsZ in the GpsB depletion or overproducing strains. 1) Figure 1E: the poorly segregated chromosomes in B. subtilis cells after GpsB overproduction are puzzling and were never discussed further. 2) Figure 1J-K: Why is the DAPI staining diffuse in panel J, while it is at the cell periphery in panel K? Why would DNA be at the cell periphery, unless GpsB itself drags DNA there? Is this a possibility? These odd results were never mentioned. The DAPI staining in Figures 2-3 looks much more normal. 3) Were the levels of GpsB overproduction similar in B. subtilis cells vs. S. aureus cells? 4) Subsection “Overproduction of S. aureus GpsB inhibits cell division in B. subtilis and S. aureus”, third paragraph and Figure 2: It seems that only a fraction of dividing S. aureus cells that are being depleted for GpsB have a nucleoid segregation defect. Unfortunately, the extent of this defect was not quantified, but from the images provided, only a few anucleate cells are apparent. Do the authors think that this defect is similar to the nucleoid segregation defect observed by Land et al. for S. pneumoniae in the absence of GpsB? 5) These experiments require much more rigor. First, the proportion of anucleate cells in the population needs to be quantitated. It is possible that to maintain overall ability to form a colony, a very high proportion of S. aureus cells must have nucleoids, but at this point it is impossible to tell. Second, the extent of GpsB depletion in the cell population (e.g., a western blot comparing protein levels during depletion with WT levels) was not shown, making it difficult to conclude much even if more quantitation of anucleate cells were done. 6) Subsection “Overproduction of S. aureus GpsB inhibits cell division in B. subtilis and S. aureus”, third paragraph: The accumulation of membrane debris was not at all apparent from the micrographs of FM4-64 staining, and neither were any explanations for this phenomenon or implications for the cell. 7) The time-lapse series in Figure 2D-F was not well presented. Although the cartoons to the right helped, it seems that the highlighted cells never formed visible division septa during the time course (contrary to what is claimed in the third paragraph of the subsection “Overproduction of S. aureus GpsB inhibits cell division in B. subtilis and S. aureus”), whereas septation in other cells, such as those at the right of the panel) seemed to progress in septation. Moreover, these cells had apparently normal segregated nucleoids. So it is not clear (a) how typical this time course is or (b) what proportion of the cells in this population have normal nucleoids and normal ability to segregate them. 8) Figure 2: The arrows and arrowheads were not defined. Also, there is no scale bar for panels D-F; they look slightly magnified compared with panels A-C.
9) Subsection “Overproduction of S. aureus GpsB inhibits cell division in B. subtilis and S. aureus”, end of third paragraph: the idea of a timing defect is speculative. In addition to the abnormal nucleoid distribution being a rare event (see comments #4-5 above), there is no direct evidence that there is a timing defect. Another possibility is that GpsB depletion somehow causes nucleoid segregation to run in reverse, at least in some cells. 10) Subsection “GpsB localizes to mid-cell and co-constricts with the divisome”, second paragraph: without doing a 3D reconstruction as was done in Figure 3Biii', it is not possible to confirm that Figure 3Bi shows a ring structure, although it is likely. Surely there must be some tilted cells that show the FtsZ/GpsB ring, as was shown in Pinho's Nature Reviews article. 11) Subsection “GpsB localizes to mid-cell and co-constricts with the divisome”, end of second paragraph: The localization of GpsB to the cell periphery in adjacent daughter cells instead of to new septal rings suggests that GpsB localizes later than FtsZ. This would be similar to what was observed for S. pneumoniae (Land et al.). It would have strengthened this section of the manuscript to show whether GpsB localizes later than FtsZ, and this would also test the model in Figure 6. 12) The high critical concentration for S. aureus FtsZ assembly suggests that this FtsZ needs a stimulatory factor for its assembly in vivo, and the massive increase in FtsZ bundling certainly makes a case for GpsB as a candidate for one of these factors. Localizing FtsZ in GpsB-depleted cells would be one way to validate this idea in vivo and provide some type of correlation between in vivo and in vitro results, for which there is none at present (see main comment above). 13) Subsection “GpsB stimulates GTPase activity of FtsZ”: Do the authors know what the approximate concentration of FtsZ is in S. aureus cells? FtsZ can form aberrant structures when it is highly concentrated, and these structures are also dependent on buffer and pH conditions. The authors have shown that S. aureus FtsZ's GTPase activity is heavily dependent on concentration, probably because its assembly is as well. Therefore, using concentrations of FtsZ that are several-fold higher than what is in cells may give artifactual results. 14)Subsection “GpsB stimulates GTPase activity of FtsZ”: The 3-fold stimulation of GTPase by GpsB is significant and interesting, but of course it is relative to a very low basal GTPase activity that, at a more physiological concentration of 10 μM, calculates to about 3 GTP hydrolyzed per FtsZ per hour. So that means GpsB can bring that number up to 10. The authors should discuss whether those rates of hydrolysis make physiological sense given the doubling time of S. aureus and the likelihood of FtsZ treadmilling at the septal ring (see two recent Science papers on this topic). 15) "did not appreciably stimulate" seems to be true, but perhaps the data suggest that GpsB might inhibit GTPase activity? 16) How reproducible is the separation of GpsB into hexamer and dodecamer fractions as shown in Figure 4C? 17) The y axes in Figure 4D-E are not the same as in 4C, where the rate per mol of FtsZ is a more intuitive way to present the data. Perhaps these could be harmonized. 18) The authors conclude that GpsB stimulates FtsZ GTPase activity sub-stoichiometrically. Does increasing GpsB concentration stimulate FtsZ's GTPase activity further? 19) What is the GpsB:FtsZ ratio in cells? How close to this ratio are the experimental conditions? 20) Subsection “GpsB interacts with and bundles FtsZ polymers”, second paragraph and Figure 5: Despite the claim in the text, no obvious structures are visible in the micrographs other than those in F-G.
21) Subsection “GpsB interacts with and bundles FtsZ polymers”, last paragraph and Figure 5N: it looks like FtsZ polymerized at the same rate in the presence of GpsB, just more extensively, so the wording should be changed. And as mentioned elsewhere, "polymerized" likely reflects bundling of protofilaments, not polymerization of single protofilaments. 22) How reproducible is the disappearance of fluorescent FtsZ polymers and loss of light scattering signal in response to GpsB? This is certainly an intriguing result, but needs more rigorous corroboration before it can be a major conclusion of the paper (and in the title). Even then, any conclusion about GpsB regulation of FtsZ assembly needs to come with the caveat that GpsB likely interacts with multiple divisome proteins (e.g. see Rued et al., 2017, for examples in S. pneumoniae) that may modulate its activities. 23) Discussion, first paragraph: As there is no in vivo evidence to back up the in vitro data, this conclusion seems premature. 24) Discussion, second paragraph: the logic here is cloudy, as it is not clear why depletion of a protein that both positively and negatively regulates FtsZ assembly could result in incorrect timing of cell division, particularly as this incorrect timing was not directly shown (see comments above). 25) "GpsB rapidly colocalized with the cell division machinery at the onset of cytokinesis". This is partially true, but perhaps more importantly, there seems to be a delay between the arrival of FtsZ and that of GpsB, because GpsB is not localized to the ring (and yet is localized to the membrane) in newborn cells. If GpsB is important for FtsZ ring assembly, which is implied by the model, how might that be reconciled? 26) "consistent with its role in modulating the activity of FtsZ". It is also consistent with its ability to bind a divisome component, which could be FtsZ but also could be something else such as EzrA. 27) Discussion, third paragraph: In their model, the authors assume that FtsZ disassembly is a feature of ring constriction. While this may be true, there is also published evidence that increased FtsZ filament density is important for ring constriction. At this point, it is totally unclear what happens to FtsZ assembly state during constriction in S. aureus. 28) Discussion, third paragraph and following are indeed very speculative considering that they are largely based on one gel filtration experiment. 29) Discussion, third paragraph: Might another model be that the L35S mutant GpsB fails to redistribute in the cell because it interacts poorly with FtsZ? 30) Discussion, third paragraph: While the correlation between EzrA and GpsB may be true, it is misleading to correlate them because they both have similar depletion phenotypes; depletion of any protein important for S. aureus cell division will result in cell enlargement. 31) Discussion, last paragraph: If this model is true, then an interesting and straightforward experiment would be to determine if there is a time lag in GTP hydrolysis compared with assembly. The prediction is that assembly should occur prior to hydrolysis. 32) Figure 6: although quite a bit of text early in the paper is devoted to the aberrant nucleoid segregation in response to excess or depleted GpsB levels, the nucleoid is ignored in the model. 33) Figure 6: the model for GpsB is reminiscent of a model for ZipA and FtsA in E. coli, with ZipA as the FtsZ bundler and FtsA as the debundler. 34) Do the authors know whether the His6 tags on both of the proteins have any aberrant effect on their interactions? Thank you for submitting your article "An essential Staphylococcus aureus cell division protein directly regulates FtsZ dynamics" for consideration by eLife. Your article has been reviewed by three peer reviewers, and the evaluation has been overseen by a Reviewing Editor and Anna Akhmanova as the Senior Editor. The following individual involved in review of your submission has agreed to reveal his identity: William Margolin (Reviewer #2). This revised manuscript represents a significant improvement over the original submission. Most importantly, biochemical and cytological experiments are for the most part now sufficiently rigorous and multiple controls have been added to the benefit of the entire study. It is proposed that higher FtsZ bundling and thus higher local concentrations lead to higher GTPase activity. As mentioned in the Discussion this would be in contrast to other proteins such as E. coli ZapA or ZapC that bundle FtsZ without activating GTPase activity. The sedimentation results show nicely that GpsB interacts with FtsZ; but if GpsB bundles FtsZ, why then would its addition not increase the amount of FtsZ in the pellet fraction? Is the fraction of FtsZ bundles already maximized in these conditions? This should be commented upon because the sedimentation results are currently at odds with the light scattering experiments. An alternative model consistent with the sedimentation data that the authors might consider is that GTP hydrolysis is not a consequence of FtsZ bundling but instead is required for bundling, perhaps because GpsB-mediated FtsZ bundling only occurs after FtsZ subunits become poised for turnover. In other words, GpsB stimulates GTP hydrolysis by FtsZ, which then triggers a conformational change that stimulates lateral interactions between FtsZ protofilaments. This could be tested by repeating the sedimentation with GTP instead of GMPCPP, matching the conditions in the light scattering experiment. If enough GTP is provided, e.g. 4 mM or so, the low hydrolysis rate of FtsZ makes it unlikely that GTP will be exhausted during the experiment. The prediction is that the ability of FtsZ to hydrolyze GTP will allow GpsB to bundle FtsZ and consequently pellet much more efficiently. This also predicts that FtsZ bundles would not be detectable by EM in the presence of GpsB and GMPCPP instead of GTP. We are pleased that the reviewer appreciated that this was a good starting point to clarify the function of GpsB. We have responded to all the reviewer’s concerns below, with fresh experiments when required, to ensure that this becomes a more complete story. Agreed. We have now included a comparison of the DivIVA and GpsB structural features in the Introduction (second paragraph). We have now included an immunoblot (new Figure 1—figure supplement 1B) that indicates the extent of GpsBSa overproduction in B. subtilis in the presence and absence of inducer (note: the GpsBSa antibody does not recognize the B. subtilis GpsB ortholog). Additionally, we have included an immunoblot that indicates the extent of overproduction of plasmid‐encoded GpsBSa in S. aureus (new Figure 1—figure supplement 1C). The data are discussed in the first and third paragraphs of the subsection “Overproduction of S. aureus GpsB inhibits cell division in B. subtilis and S. aureus”. We thank the reviewer for pointing this out. We re‐imaged these strains, paying more attention to the chromosomal arrangement, and found that the nucleoids are indeed well segregated in the filamentous strains, suggesting that the filamentation defect in B. subtilis is independent of chromosome segregation. The revised image is now reported in a new Figure 1B‐M. This nucleoid segregation pattern was also evident in the various B. subtilis deletion strains we tested (please see next response). We have therefore now stated more explicitly that GpsB specifically interferes with cell division. We appreciate the suggested experiment and took this a step further. In addition to B. subtilis GpsB and DivIVA, we tested the dependence of every reported GpsB‐interacting protein (PrkC, PonA, and EzrA) for the filamentation phenotype. The results, presented in a new Figure 1B‐M, indicated that B. subtilis GpsB, DivIVA, PrkC, PonA, and EzrA are not required for GpsBSa‐mediated B. subtilis filamentation. Please provide numbers for how many uninduced cells have septa and how many cells have septa after induction of GpsB overproduction. We have now reported the percentage of cells <1.2 μm in diameter and >1.2 μm in diameter in WT, WT + vector, and upon overproduction of the S. aureus and B. subtilis ortholog of GpsB. The microscopy data are shown in a new Figure 2 and the quantification are reported in the third paragraph of the subsection “Overproduction of S. aureus GpsB inhibits cell division in B. subtilis and S. aureus”. In the revised version, since we have shown that overproduction of GpsBSa in B. subtilis indeed did not result in a defect in chromosome segregation, we have removed the DAPI images in the revised version of the figure (now Figure 2A‐J). Instead, we have more carefully shown that overproduction of the B. subtilis ortholog or the L35S variant does not result in cell enlargement. Please include experimental data to demonstrate that GpsB has been depleted in the experiments shown in Figure 2. We have now included an immunoblot (new Figure 1—figure supplement 1F) that shows the depletion of GpsB upon induction of the antisense. It is worth noting that induction of the antisense RNA resulted in cell lysis, which prevented efficient extraction of bulk protein from the culture. We therefore induced the construct and collected samples at an earlier time point, before cell lysis took over the culture, and quantified the fold decrease. As a result, the GpsB that we detected is likely over‐represented and the fold‐depletion we calculated is likely an underestimation. Along the same lines, it seems that a construct in which expression of gpsB is regulated directly (and without the extra step with the antisense RNA) would be a more simple experimental setup. We agree! This was certainly not our preferred method to test the depletion phenotype of GpsB. However, we were unsuccessful (multiple times) in knocking out the native copy of gpsB in the presence of an inducible copy of the gpsB, which is why we attempted the antisense RNA method for knocking down gpsB. We would point out that a similar antisense depletion strategy was recently reported by Pinho’s group for the depletion of DivIB, DivIC, and FtsL in S. aureus (Nature, 2018 PMID: 29443967). Agreed. We have now repeated the time lapse depletion experiment and show a field in which every cell shows a cell division defect (new Figure 2L‐M). We report that depletion of GpsB prevents initiation of cell division in cells that have not started dividing and arrests cell division in cells that have initiated cell division. Cells also accumulate aberrant membrane accumulations that preceded lysis. In the revised version of the paper, we have now shown the direct involvement of GpsB in cell division by examining its effect on the divisome directly (ZapA, a proxy for FtsZ) and, conversely by demonstrating the dependence of GpsB localization on the divisome. Moreover, we have shown in a purified system that GpsB is sufficient to influence FtsZ assembly kinetics. Taken together, we hope that we have convinced the reviewer that the phenotypes can be explained by a direct interaction of GpsB with the divisome. We certainly sought an answer to this question ourselves, but ultimately this is the only requested experiment that we were unable to perform exactly as requested, entirely due to technical reasons. Since we were unable to obtain a clean gpsB deletion strain (despite our best efforts), we were unable to complement it with an inducible copy of WT gpsB or gpsBL35S. We are currently attempting other strategies to perform this experiment, but did not want to delay submission of the current manuscript. That said, we did test the effect of the overproduced L35S allele in a merodiploid strain of S. aureus that also harbored the WT copy of gpsB. The results indicate that the L35S allele is recessive in vivo in S. aureus. We have included this as a revised Figure 2I‐J. We hope that our identification of this allele, the demonstration that it loses function when expressed in B. subtilis, is recessive in vivo in S. aureus, and the demonstration that it does not function in vitro will be sufficient in this report. We have now monitored localization of GpsB in cells treated with the FtsZ inhibitor PC190723. A similar strategy was recently reported by Pinho’s group for studying the effects of FtsZ depletion in S. aureus (Nature, 2018 PMID: 29443967). The results, presented in a new Figure 4A‐F’, indicate that GpsB localization depends on FtsZ. Agreed. We examined the localization of ZapA‐GFP, which has been used as a proxy for FtsZ localization. Upon depletion of GpsB, the cells eventually lysed. However, before they lysed, we examined ZapA‐GFP localization and found that Z‐rings formed at mid‐cell as GpsB was depleted, but the intensity of the ZapA‐ring was ~4‐fold fainter than WT. We concluded that GpsB promotes the robust assembly of the Z‐ring and that FtsZ and GpsB reciprocally influence each other. The results are presented in a new Figure 4J‐K’. In cells overproducing GpsB, ZapA‐GFP mislocalized in 86% of the enlarged cells. These results are shown in Figure 4G‐I’. GTP hydrolysis figures referenced now express turnover in pmol min‐1 or pmol min‐1 pmol FtsZ‐1, as appropriate. We have now replaced the in vitro fluorescence micrographs in (now) Figure 6 with purified FtsZ and GpsB with EM images. The images are qualitatively similar to those published by the Erickson lab (see Author response image 1; Panels A-C (left) are reproduced from Figure 4 of Chen et al. 2017, Scientific Reports 7:3650, published under the terms of the Creative Commons Attribution 4.0 International license (CC BY 4.0; http://creativecommons.org/licenses/by/4.0/))) that demonstrated the ability of E. coli ZipA to bundle FtsZ filaments (please compare arrowheads to arrowheads; arrows to arrows). Bundling of E. coli FtsZ filaments by ZipA, compared to bundling of S. aureus FtsZ filaments by GpsB. We have tested S. aureus FtsZ polymerization in the presence of GTP, GDP, ATP, and ADP. The data (included as a new Figure 6—figure supplement 1A) indicate that, like orthologs of FtsZ from other bacteria, S. aureus FtsZ only polymerizes in the presence of GTP. In the revised version, we have responded to every concern raised, often with fresh experiments. Notably, all the in vitro experiments have been repeated with an untagged S. aureus FtsZ, and we now explicitly discuss in the text how these results may be consistent with a treadmilling activity for FtsZ. The result, we think, is a greatly improved manuscript that will we hope will reignite the reviewer’s initial enthusiasm. We agree that the S. aureus experiments are ultimately the most informative, but the transcomplementation experiments in B. subtilis foreshadow the sufficiency of GpsB in interacting with FtsZ that is formally demonstrated in the biochemical experiments at the end of the paper. Moreover, reviewers 1 and 3 asked for additional experiments in B. subtilis to clarify our initial observation. In the revised version, we have therefore reported these experiments (and the experiments requested by the other reviewers) in a new Figure 1, but we are of course open to removing all the B. subtilis data if the reviewers suggest it is appropriate. Agreed. We have examined the localization of FtsZ‐GFP in B. subtilis when GpsB was overexpressed and observed that FtsZ‐GFP itself mis‐localized in the cytosol. The data are now reported in Figure 1N‐O. We have now directly examined lateral interactions between FtsZ polymers using EM. Please see our detailed response to comment #4 below. We had included a sedimentation experiment in the original submission that has now been repeated with untagged FtsZ in the current submission. In the original submission, we also showed lateral interaction in vitro with fluorescently FtsZ polymers. In the present submission, we have replaced this experiment in Figure 6 with EM images that more directly demonstrate bundling of FtsZ polymers. As we noted in the response to reviewer 1 (Author response Image 1, the images are qualitatively similar to those published by the Erickson lab (Figure 4A-C in Sci Rep 2017; 7:3650) that demonstrated the ability of E. coli ZipA to bundle FtsZ filaments (please compare arrowheads to arrowheads; arrows to arrows). Agreed. We have substituted “polymerization” with “assembly” to describe FtsZ behavior in the light scattering and centrifugation experiments. We use the term “bundling” when we directly observe it in the new EM experiments. We have now included a discussion comparing our in vitro data to the physiological concentration of FtsZ and GpsB in S. aureus (Discussion, first paragraph). Briefly, FtsZ and GpsB are reported to be present at 4452 and 1659 molecules per cell (Zuhlke et al., 2016; primary data found in http://aureowiki.med.unigreifswald.de/SACOL1199 and http://aureowiki.med.uni‐greifswald.de/SACOL1484), which is equivalent to 7.4 × 10‐21 moles of FtsZ. If we consider a S. aureus cell with a diameter of 0.8 µm, the cell volume is 2.7 × 10‐16L, so the molarity of FtsZ in vivo is 27.6 µM: remarkably close to the 30 µM that was required for our purified FtsZ to show appreciable activity. The intracellular concentration of GpsB is 2.7‐fold less than FtsZ, or 10.2 µM‐ again, remarkably close to the 10 µM we used in our in vitro experiments. We have now included, in a new Figure 1—figure supplement 1B‐C, immunoblots that show the extent of overproduction of GpsB in B. subtilis and S. aureus. We agree with the reviewer that this was a very poor choice of words. We have now described the plateau as indicating that the reaction is in steady state. Please see the detailed response to point #6. The intracellular concentration of FtsZ in S. aureus is ~28 µM and that of GpsB is ~10 µM‐ remarkably similar to the concentrations required in our in vitro experiments that showed activity. Thus, we have used FtsZ and GpsB at concentrations that are nearly identical to their in vivo concentrations. The cited paper reported that “…the basal activity of the enzyme is significantly lower (∼0.5 GTP/FtsZ/min) than we observed for EcFtsZ or BsFtsZ.” By comparison, we too observed FtsZ activity (~0.1 GTP/FtsZ/min; Figure 5D) when we used 10 µM FtsZ‐ a very similar turnover as reported by Anderson et al. We have now cited this paper in the Results section as consistent with the slow GTP turnover rate by FtsZ reported here. Additionally, we now have included experiments in Figure 5F that test the effect of GpsB on 10 µM FtsZ. There is indeed a slight but insignificant increase in GTPase activity, but the overall rates are so low that it is difficult to draw a firm conclusion. We have now replaced all previous experiments in the manuscript with experiments that use only untagged S. aureus FtsZ. The data are now reported in new Figures 5‐6. We certainly appreciate that these two seemingly contrasting activities have not been observed previously‐ indeed, we ourselves initially struggled with reconciling these observations. That said, we have demonstrated, in a purified system, that 1) addition of GpsB alone stimulates GTP hydrolysis of FtsZ, and 2) promotes lateral interactions between FtsZ polymers as measured by electron microscopy. The model we have proposed states that promoting lateral interactions between FtsZ filaments (which we refer to as “bundling”, in keeping with the nomenclature for similar in vitro phenomena observed using E. coli for example) increases the local concentration of FtsZ and increases GTPase activity. A slight variation of this model, which we also included in the Discussion, is that GpsB may remodel FtsZ conformation to “stimulate” GTPase activity. It is critical to note that, for previously reported proteins, FtsZ bundling activity was the endpoint of their activity. Here, we are proposing that bundling is an intermediate step that allows for the stimulation of GTPase activity. Agreed. We have revised the model to suggest that enhanced GTP turnover by FtsZ, stimulated by GpsB, likely leads to increased treadmilling, which drives progression through the cell cycle. Light scattering assays performed on FtsZ, after removal of the histidine tag and shown in Figure 6, suggest that steady state is reached in ~10‐25 min and shortly thereafter, disassembly is favored. In the in vitro assay, this is due to GTP depletion. As described in the response to point #11, we have revised the model to suggest that enhanced GTP turnover by FtsZ, stimulated by GpsB, likely leads to increased treadmilling, which drives progression through the cell cycle. We did not detect either a lag or bimodal rates in time course experiments following GTP hydrolysis. Light scattering assays performed on FtsZ, after removal of the histidine tag and shown in Figure 6, are shorter (signal begins to fall by ~25 min) and consistent with GTP hydrolysis assays (i.e., 60 min or less). Agreed. We now report (in a new Figure 6—figure supplement 1B) that, in the presence of a regeneration system, FtsZ does not disassemble during this time period. The argument presented in Figure 6L, where FtsZ disassembles after “hyper” assembly in the presence of GpsB, is that the assembly and bundling is reversible. We suggest that the enhanced GTP turnover may correlate to the onset of rapid treadmilling activity in vivo. Actually, we think that the reviewer’s model is quite consistent with what we have proposed. In the new model figure (Figure 7B), we purposely show discontinuous FtsZ and GpsB localization at the division site. Our model now explicitly proposes that GpsB increases local concentration of FtsZ, which triggers GTPase activity, which may be linked to the onset of treadmilling. […] Although the new information about S. aureus GpsB is interesting and welcome, particularly the direct interaction with FtsZ, this paper has a number of significant shortcomings. The main one is that the data do not provide sufficient support for many of the conclusions, including the regulation of assembly and disassembly of FtsZ described in the title. For example, key conclusions about FtsZ bundling and un-bundling are made from experiments with likely non-physiologically high levels of FtsZ (30 μM). The main conclusions about FtsZ bundling come from fluorescence experiments, but without inspection of these structures by EM, it is difficult to tell whether they are aggregates or bundles of protofilaments (especially as they are tens of microns in width, which would require thousands of FtsZ protofilaments to associate laterally). We are glad to read that the reviewer found our paper interesting and welcome! In the revised version, we have responded to each of the reviewer’s concerns with fresh experiments as required, including examining the bundled FtsZ structures using EM. Specific responses to each major point is included below. We re‐imaged these strains paying more attention to the chromosomal arrangement, and found that the nucleoids are indeed well segregated in the filamentous strains (WT and various mutant backgrounds requested by reviewer 1). We have now omitted these statements. The DAPI localization at the periphery was puzzling to us as well, but is likely well beyond the scope of the manuscript, which focuses on the direct interaction between GpsB and FtsZ. So that this observation can receive the proper amount of analysis, in the revised version, we have omitted the image and will follow up on this phenomenon elsewhere where we can dedicate a sufficient amount of space to analyzing the results. We have now included, in a new Figure 1—figure supplement 1B‐C, immunoblots that show the bulk overproduction levels of GpsB in B. subtilis and S. aureus and have reported the approximate fold‐overproduction in the main text (subsection “Overproduction of S. aureus GpsB inhibits cell division in B. subtilis and S. aureus”, first and third paragraphs). Overproduction was between ~3.5‐5 ‐fold. Agreed. The depletion experiment was initially a bit challenging for us, but after optimizing conditions, we have now repeated the time lapse depletion experiment and show a field in which every cell shows a cell division defect (new Figure 2L‐M). We report that depletion of GpsB prevents initiation of cell division in cells that have not started dividing and arrests cell division in cells that have initiated cell division. Cells also accumulate aberrant membrane accumulations that preceded lysis. Due to phototoxicity issues, we did not monitor chromosome segregation. We hope that, for the current report showing the direct interaction between FtsZ and GpsB, that we may focus on the cell division defects caused by depletion of GpsB. We have now included an immunoblot (new Figure 1—figure supplement 1F) that shows the depletion of GpsB upon induction of the antisense RNA. It is worth noting that induction of the antisense RNA resulted in cell lysis, which prevented efficient extraction of bulk protein from the culture. We therefore induced the construct and collected samples at an earlier time point, before cell lysis took over the culture, and quantified the fold decrease. As a result, the GpsB that we detected is likely over‐represented and the fold‐depletion we calculated is likely an underestimation. The new experiment now combines a larger field of cells that display the cell division phenotype, quantification of cells that show cell division defects, and a clear demonstration that GpsB is being depleted. In a revised Figure 2L‐M, we have now included time lapse images of cells that are being depleted of GpsB. In the image, we show the aberrant accumulation of membrane upon GpsB depletion and point out two populations of cells: those that have initiated cell division, but become arrested; and those that have not initiated cell division and fail to initiate. Both cell types accumulate aberrant membranes and ultimately lyse. We interpret membrane accumulation as likely resulting from impaired cell division. We have now optimized the conditions for growth under the agarose pad and the imaging to reduce phototoxicity. The result, we think, is a much clearer representation of the cell division arrest phenotype, so we have eschewed the cartoon representation for this figure (now Figure 2L‐M). We thank the reviewer for catching this. In the revised Figure 2, all arrows and arrowheads are now defined in the legend, and scale bars are included for images represented at different magnifications. We agree. We have now softened the conclusion here and claim only that 1) GpsB depletion arrests cell division, 2) causes the aberrant accumulation of membranes, and 3) ultimately results in cell lysis. We have now included 3D reconstructions of all 2D images that were rotated around the y‐axis to check if GpsB formed ring‐like structures. The results are presented in a new Figure 3B, which show that GpsB forms a single ring structure at the onset of cell division, co‐constricts with the septum as a ring as cell division proceeds, and eventually collapses into a focus at the center of the septum, whereas it localized to the cell periphery in recently divided cells. Agreed. We have now noted (subsection “GpsB dynamically localizes to mid-cell in S. aureus and co-constricts with the division septum”, last paragraph) the similarity to S. pneumoniae and have cited Land et al. The two‐color time lapse experiment proved a bit difficult for us due to phototoxicity issues. Nonetheless, to investigate the dependence on FtsZ, we have examined the localization of GpsB in cells that were treated with an FtsZ inhibitor. The data are now presented in a new Figure 4A‐F. As the reviewer predicted, GpsB remained localized at the cell periphery, suggesting a genetic dependence on FtsZ. We thank the reviewer for the suggestion. Agreed. 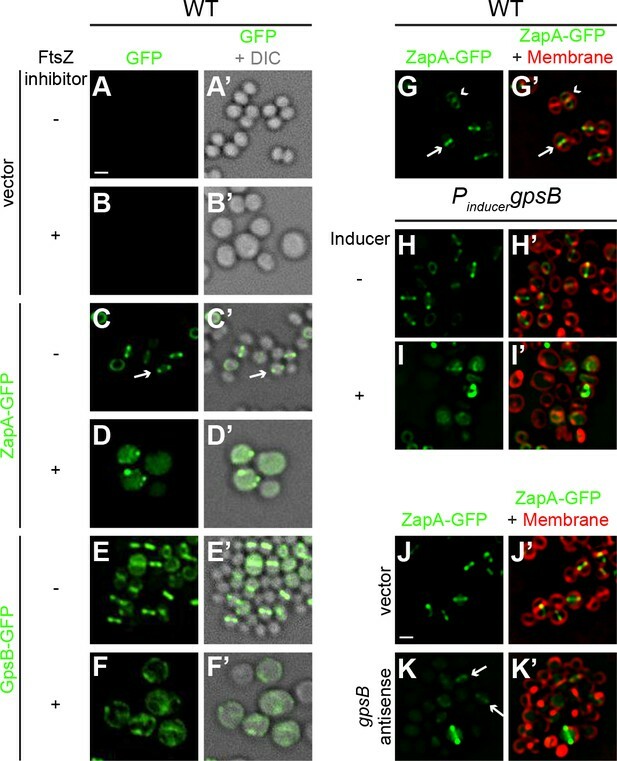 In a new Figure 4G‐K, we investigate the localization of ZapA‐GFP (proxy for FtsZ) in 1) cells overproducing GpsB, and 2) cells in which GpsB is depleted. In GpsB‐overproducing cells, ZapA‐GFP fails to localize, consistent with a model in which excess GpsB may lead to premature dis‐assembly of FtsZ. In the absence of GpsB (prior to cell lysis), interestingly, ZapA‐GFP localizes to mid‐cell, but the localization is very faint. This is consistent with the in vitro data where we claim that robust assembly (bundling) of FtsZ, but not necessarily subcellular localization, requires GpsB. We have now included a discussion comparing our in vitro data to the physiological concentration of FtsZ and GpsB in S. aureus (Discussion, second paragraph). Briefly, FtsZ and GpsB are reported to be present at 4452 and 1659 molecules per cell (Zuhlke et al., 2016; primary data found in http://aureowiki.med.unigreifswald.de/SACOL1199 and http://aureowiki.med.uni‐greifswald.de/SACOL1484), which is equivalent to 7.4 × 10‐21 moles of FtsZ. If we consider a S. aureus cell with a diameter of 0.8 µm, the cell volume is 2.7 × 10‐16L, so the molarity of FtsZ in vivo is 27.6 µM: remarkably close to the 30 µM that was required for our purified FtsZ to show appreciable activity. The intracellular concentration of GpsB is 2.7‐fold less than FtsZ, or 10.2 µM‐ again, remarkably close to the 10 µM we used in our in vitro experiments. Thus, we have used FtsZ and GpsB at concentrations that are nearly identical to their in vivo concentrations. The reviewer raises an important point about artifactual assembly, which we also considered. However, the structures observed by EM at 30 μm coincide with an increase in the rate of GTP hydrolysis, which also occurs at around 30 μM. We therefore propose that the structures observed are not likely artifactual because they track with increased specific activity. If structures were aberrant and artifactual (i.e., aggregates), one would expect the rate of enzyme activity to decrease. 1) Please see our detailed response to the physiological concentration of FtsZ and GpsB in point #13. To summarize, 10 µM is not the physiological concentration of FtsZ in S. aureus, according to newer proteomic data (Zuhlke et al., 2016). The intracellular concentrations of FtsZ and GpsB in S. aureus (~28 µM and ~10 µM, respectively) are nearly identical to the concentrations that displayed activity in vitro in our experiments. Our data suggests that FtsZ polymers and regulators appear poised at the threshold between assembly and disassembly, enabling tight control over the division process. 2) Agreed. The two papers that the reviewer referred to were still relatively recent reports at the time of our first submission, so we hesitated in invoking treadmilling explicitly, even though we felt that our data were consistent with such an activity. We have now included an extensive discussion of how we envision our data would be consistent with this activity in vivo. Specifically, we propose that FtsZ polymers would be bundled and organized by GpsB and, following this step, treadmilling would increase as GTP hydrolysis increases. We have also modified our model figure (Figure 7) to incorporate the role of treadmilling in the context of our model. The mean hydrolysis rate of FtsZ in the presence of GpsB(L35S) is well within the first quartile of data we collected when FtsZ was incubated with WT GpsB (Figure 5F). Combined with the inability of the L35S variant to interact with FtsZ (Figure 6A), we feel uncomfortable suggesting that the GpsB(L35S) negatively influences FtsZ activity and therefore prudently stated that it does not stimulate it. We hope the reviewer agrees with our statement. We have now indicated in the legend for Figure 5 that the chromatogram is representative of at least three independent purifications. Agreed. The graphs in Figure 5D‐F are now expressed either in pmol/min or pmol/min/pmol, as appropriate. We were ourselves interested in this question. However, it was difficult to achieve higher concentrations than 10 µM for GpsB in the reaction so, combined with our observation that FtsZ hydrolysis jumped drastically between 8 and 10 µM GpsB, we left 10 µM as the highest concentration we tested. We hope this will suffice for this initial report. Please see the detailed response to this question in point #13 above. Briefly, the calculated intracellular concentration of FtsZ is ~28 µM and that of GpsB is ~10 µM‐ nearly identical to the 30 µM FtsZ and 10 µM GpsB that displayed activity in our in vitro experiments. On the advice of the other reviewers, we have now replaced the fluorescence micrographs with electron microscopy images to demonstrate lateral interactions between FtsZ polymers. The data are now presented as a new Figure 6B‐I. Agreed. We have now largely replaced “polymerized” with the more generic term “assembly”. Both experiments were, of course, very reproducible (n>3). The fluorescence data are no longer presented, on the advice of the other reviewers, and has been replaced by EM images to show bundling. To dovetail our results with the treadmilling model of FtsZ, we have now rewritten the manuscript to emphasize that the increase in GTPase activity and the disassembly observed in vitro is likely linked to the increase in treadmilling activity of FtsZ in vivo. As such, the title also deemphasizes the in vitro FtsZ “dis‐assembly” result and now simply states that GpsB regulates FtsZ dynamics. Regarding the contribution of other divisome proteins, it was certainly not our intention to suggest that no other divisome protein influences FtsZ. We have, though, reported that GpsB directly interacts with FtsZ which we have shown in vitro is sufficient to modulate FtsZ’s behavior in the absence of any other factors, and the model that we have presented, fitting with the scope of the paper in defining the function of GpsB in S. aureus, was meant to be limited to what we report in the paper. Since, in vivo, additional divisome components most certainly contribute to FtsZ’s dynamics, we invoked in the Discussion section the possibility, for example, that EzrA may collaborate with GpsB in S. aureus (Discussion, fifth paragraph). Since the interaction of GpsB with the other cell division proteins has not been explicitly reported yet in S. aureus, we have not incorporated the contributions of the other factors in our model. We request that the contributions of other proteins may be introduced in models presented in future reports, once we have a better understanding of S. aureus cell division. Finally, we thank the reviewer for pointing out Rued et al. We have now referenced the paper in the Introduction (second paragraph). We have removed this conclusion from the revised manuscript. Agreed. In the revised manuscript, the model has been revised to suggest that bundling by GpsB leads to increased FtsZ GTPase activity in vitro (which, in the GTP‐limiting conditions, eventually leads to disassembly detected by light scatter). in vivo, we suggest that this translates to the activation of FtsZ’s treadmilling activity (i.e., GTP cycling). Consistent with this, depletion of GpsB arrests cell division in vivo. Agreed. We have now simply stated that “…GpsB co‐localized with the cell division machinery”, not “rapidly”. In the revised manuscript, we have also shown that localization of ZapA (FtsZ proxy) occurs in the absence of GpsB, but is very faint. Together with the in vitro bundling data, we propose that GpsB permits the “robust” assembly of FtsZ, even though GpsB is not responsible for FtsZ localization at mid‐cell, per se. While it is of course possible to invoke other factors, we humbly proposed that the sufficiency of GpsB to influence FtsZ’s behavior in vitro leads to the parsimonious model that overproduction of GpsB inhibits FtsZ in vivo. This model is also consistent with our observation that overproduction of GpsB in B. subtilis led to filamentation, even in the absence of EzrA. To reiterate, the scope of this paper is, above all, to report that GpsB can directly interact with FtsZ in S. aureus. As mentioned above, we have tried to be cautious in applying lessons learned from other (even closely related) organisms, because the function of this protein seems to vary from species to species and, with respect to bundling activity, also behaves differently from other known bundlers. That said, we have not completely ignored the contribution of EzrA to our model and do indeed invoke it in the Discussion section (fifth paragraph). We agree that this is highly speculative, which is why we decided to place it in the Discussion section. Indeed, we began the sentence with “It is tempting to speculate…” so that there would be no doubt that this is not a conclusion and rather a discussion point for further study. If the reviewer wishes, we can certainly remove this entire discussion, but we feel that such speculation in the Discussion section is valuable, especially when we make it clear that we are presenting a testable hypothesis (that is beyond the immediate scope of the current paper). 29) Disussion, third paragraph: Might another model be that the L35S mutant GpsB fails to redistribute in the cell because it interacts poorly with FtsZ? Definitely! We have now indicated (Discussion, fifth paragraph) that the L35S variant may not interact with FtsZ. We thank the reviewer for the suggestion. This is certainly true. As mentioned above, this was an effort to bring into the Discussion section other cell division components, that have been reported in S. aureus to be linked to GpsB so as not to present the GpsB/FtsZ interaction in isolation. If the reviewer would like us to remove any mention of EzrA in this capacity in the Discussion section, we can certainly do so and limit the discussion solely to GpsB and FtsZ. We have revised our model to instead describe that GpsB promotes bundling and increases GTP turnover, likely through increasing local concentrations of FtsZ. Bundling appears to initiate very rapidly by light scatter (Figure 6L), and hence no detectable lag is expected based on the methods described here. We also did not observe a lag by monitoring GTP hydrolysis under the conditions tested (Figure 5C). However, this is an interesting suggestion and has also been reported for FtsZ from S. pneumoniae, which exhibits a lag in a time course of GTP hydrolysis whereby peak hydrolysis activity occurs simultaneously with maximal polymerization detected by light scattering amplitude (Salvarelli, et al., 2015). If Sa FtsZ behaves similarly, then we would expect to reach maximal hydrolysis at 10‐30 min after addition of nucleotide, the peak by light scattering. Under this scenario, if there were a lag, we would have detected it in a 10 min time course experiment; however, no lag was detected. Notwithstanding, even a modest increase in concentration (i.e., 33%, which is equivalent to the increase from 30 to 40 μM) more than doubles the rate of GTP hydrolysis, so detectable lag time measurements in the absence and presence of GpsB, which very rapidly induces bundling, would likely require rapid mix/stopped flow experiments, which we hope the reviewer agrees is well beyond the scope of this manuscript. We agree. In this preliminary report, the unusual nucleoid segregation was totally distracting and remains a mystery to us. We have therefore left this data out of the current manuscript and will attempt to follow it up at a later date. We thank the reviewer for the suggestion. We have now compared our model to that of the combined action of ZipA and FtsA in E. coli (Discussion, last paragraph). This is an important point. All of the biochemistry experiments in the revised manuscript were replaced with experiments performed with a tag‐less version of FtsZ. The His6 tag on GpsB likely does not impede GpsB function because GpsB‐His6 induces filamentation when overexpressed in B. subtilis. We thank the reviewers for the suggestion. The original intention of the sedimentation experiment in Figure 6A was to test the interaction between GpsB and assembled FtsZ polymers. To maximize FtsZ pelleting for this purpose, the experiment was performed with the non-hydrolyzable GMPCPP and at very high relative centrifugation force (130k × g). At this RCF, the experiment as originally performed likely did not distinguish between small polymers, large polymers, and bundles, which is probably why the addition of GpsB did not result in an increase in FtsZ in the pellet fraction. We have now modified the protocol by centrifuging the reactions at slower speeds. As predicted by the reviewer, we observed differential pelleting behavior of FtsZ in the presence of GpsB (and nucleotide), consistent with bundling. Furthermore, to test the alternative model posed below by the reviewers, we also performed the experiment at lower speed either in the presence of GTP or GMPCPP. The results are now presented as a new Figure 6—figure supplement 1. For +GTP experiments we empirically determined that, when centrifuged at 90k × g, addition of GpsB to the FtsZ assembly reaction resulted in increased FtsZ in the pellet fraction, consistent with the reviewers’ prediction that centrifugation should reveal additional FtsZ in the pellet if FtsZ polymers were indeed bundling. For +GMPCPP experiments, the GMPCPP-stabilized FtsZ polymers are much longer, as observed by TEM in the new Figure 6—figure supplement 1D, and we empirically determined that, when centrifuged at 20k × g, addition of GpsB again resulted in increased FtsZ in the pellet fraction. The modified centrifugation experiments are now consistent with the light scattering experiments. In sum, we have now demonstrated using three different techniques (differential centrifugation, 90° light scattering, and electron microscopy) that GpsB promotes the assembly of higher order FtsZ structures. Additionally, the new differential centrifugation assay performed with GMPCPP (accompanied by additional electron microscopy studies – please see below for an expanded discussion) indicate that GTP hydrolysis by FtsZ is not required for the GpsB-mediated assembly of higher order FtsZ structures. Since the original sedimentation experiment showed robust FtsZ pelleting (by using GMPCPP and high RCF), and the reviewers thought it was convincingly demonstrated GpsB interaction with FtsZ, we have retained that experiment in Figure 6A. The new differential centrifugation experiments are now included in a new Figure 6—figure supplement 1. The revised sedimentation data (please see the discussion above) are now only consistent with a model in which GTP hydrolysis is not required for FtsZ bundling. To additionally test the alternative model proposed by the reviewers (that increased GTP hydrolysis drives FtsZ bundling), we 1) examined FtsZ assembly in the presence of GpsB and GMPCPP using electron microscopy, as suggested by the reviewers; and 2) performed the differential centrifugation experiment with GMPCPP to monitor the assembly of higher order FtsZ structures. 1) Electron microscopy. In the presence GpsB and GMPCPP, we observed increased lateral association of FtsZ filaments, indicating that GTP hydrolysis is not required for GpsB-mediated bundling of FtsZ. The results are therefore inconsistent with a model in which GTP hydrolysis drives bundling. 2) Differential centrifugation. As noted above, we observed increased FtsZ pelleting even in the presence of GMPCPP, indicating that GTP hydrolysis is not required for the assembly of higher order FtsZ structures, again inconsistent with the alternative model. We have now experimentally considered the proposed alternative model and conclude that the data are consistent with a model in which bundling precedes GTP hydrolysis. A simple model to explain the data is that GpsB promotes bundling of FtsZ filaments, thereby increasing the local concentration of FtsZ, which then permits GTP hydrolysis. in vitro, GTP hydrolysis results in the depolymerization of FtsZ polymers (and disassembly of bundles) which is observed in the light scattering experiments in Figure 6. We thank S Gottesman, S Wickner, M Maurizi, and D Chattoraj for suggestions; V Lee and members of our labs for comments on the manuscript; JP Cooper’s lab (NCI) for use of their SIM microscope; H Arjes and P Levin for S. aureus strain SH1000 and plasmid pEPSA5; L Shaw for S aureus plasmid pJB67; D Ziegler (Bacillus Genetic Stock Center) for various B. subtilis strains; and Marc Llaguno and Xinran Liu at the Center for Cellular and Molecular Imaging at Yale School of Medicine for TEM. This work was funded by a start-up grant from the University of South Florida (PJE); the National Institute of General Medical Sciences of the National Institutes of Health #R01GM118927 (JLC), #R01GM128037 (PJE), and #SC2 GM105419 (KMT); USDA National Institute of Food and Agriculture, Hatch project #232838 (JLC); Howard University Medical Alumni Association (KMT), supported in part by: Howard University Research Centers in Minority Institutions, funded by the National Institute on Minority Health and Health Disparities (G12MD007597), NIH; and the Intramural Research Program of the NIH, National Cancer Institute, Center for Cancer Research (KSR).